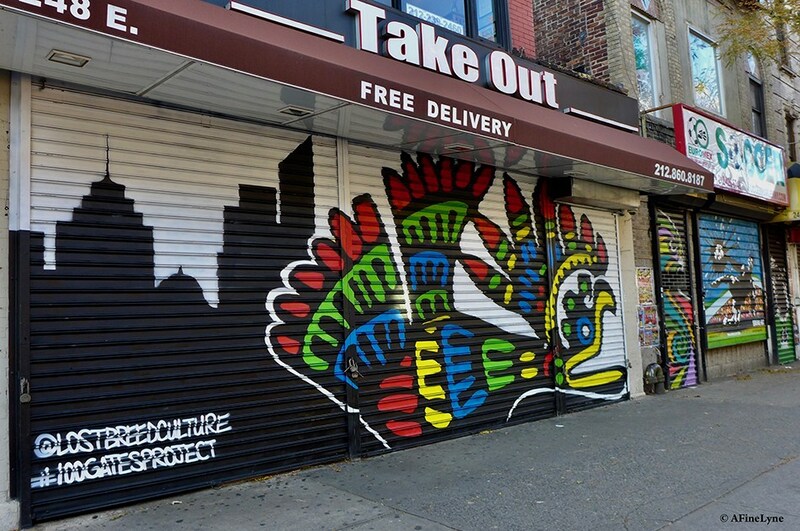 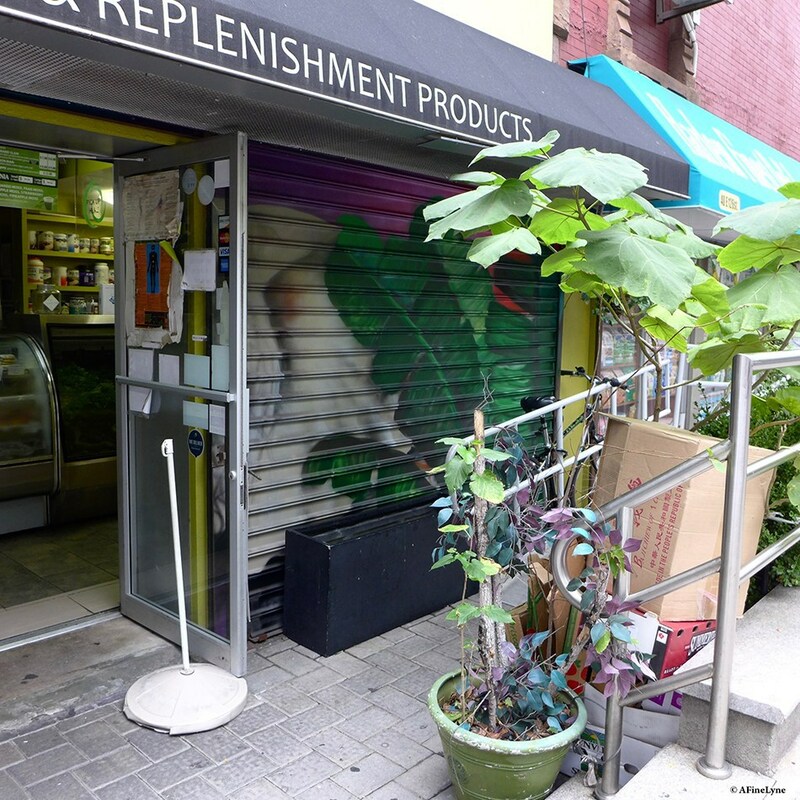 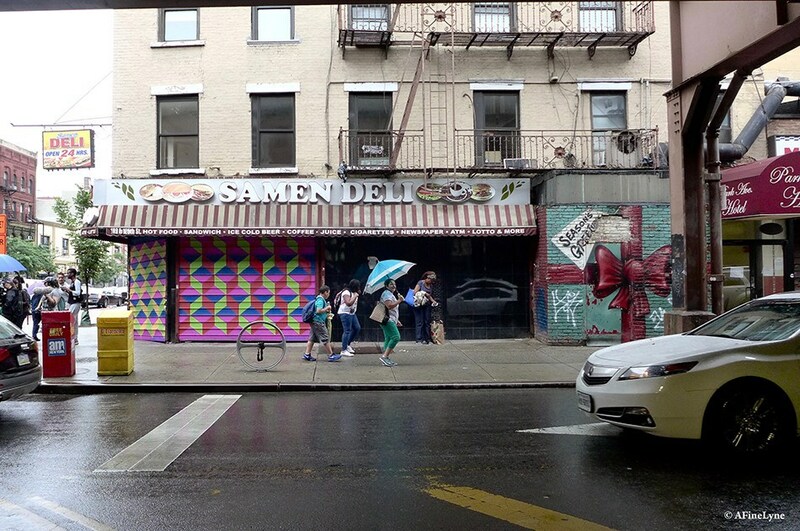 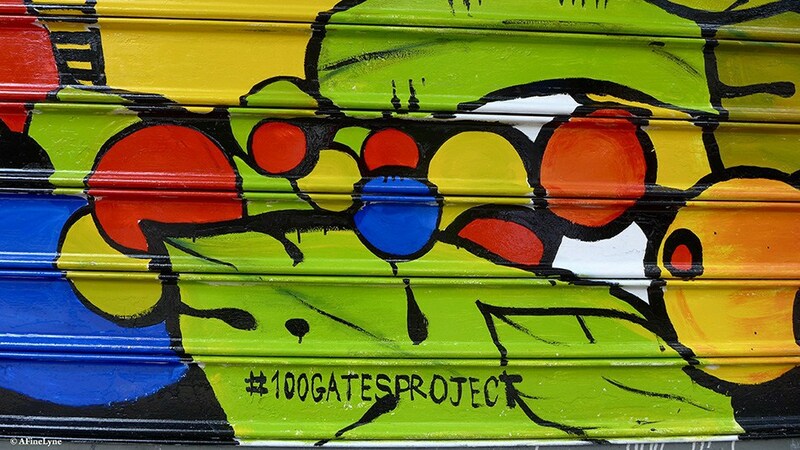 #100GatesProject, operated by the Lower East Side Partnership, has deep roots in the Lower East Side, and in the Fall of 2016, the project celebrated the 100th gate in the Lower East Side at none other than the iconic Katz’s Deli. 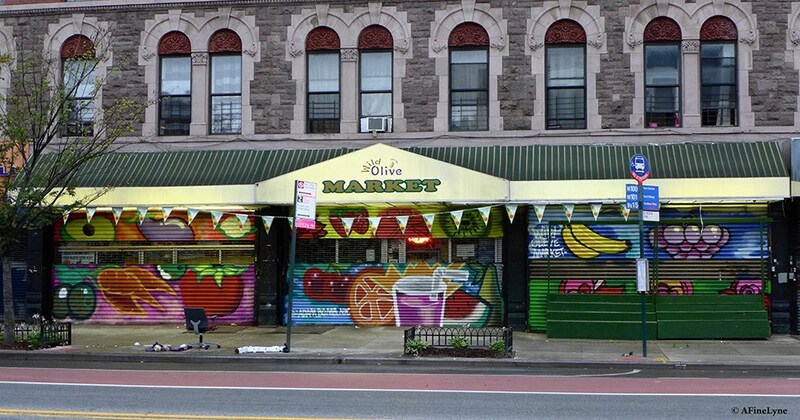 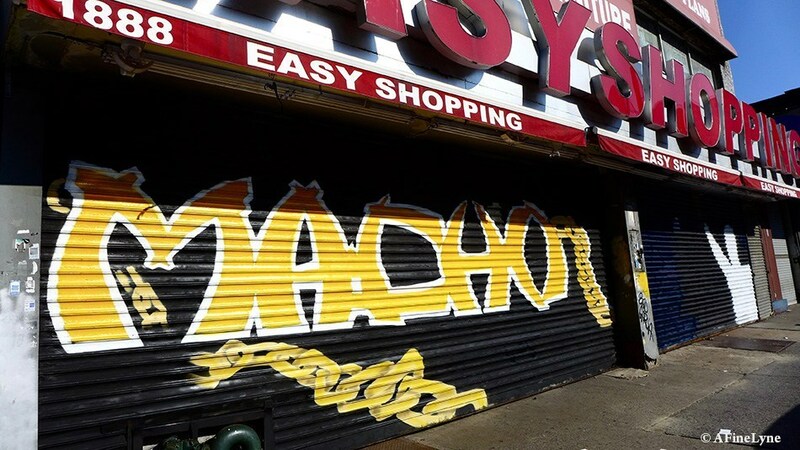 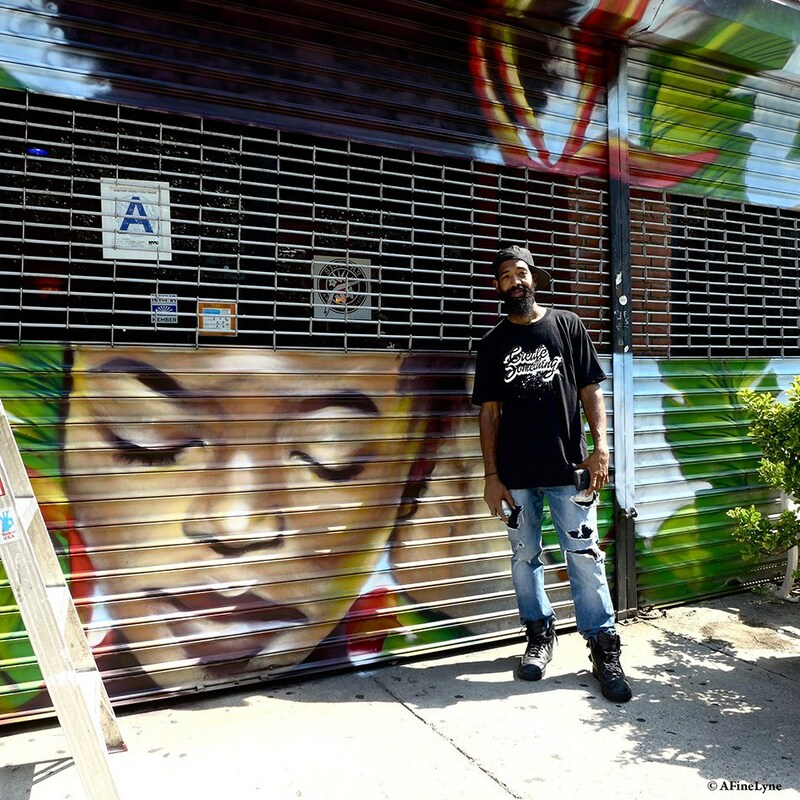 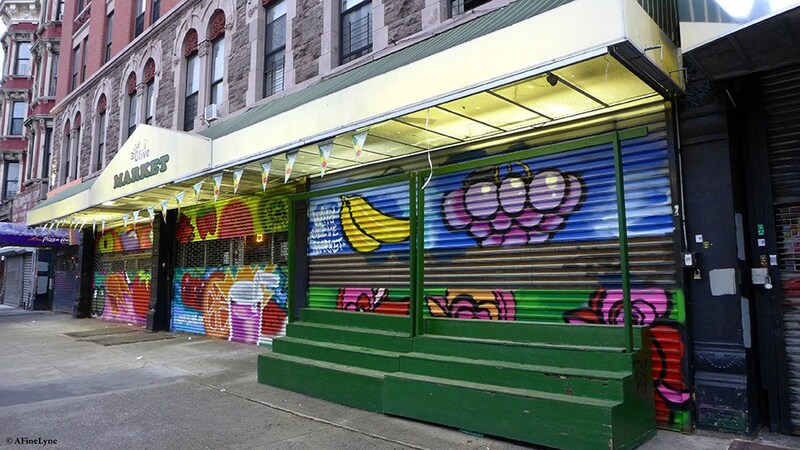 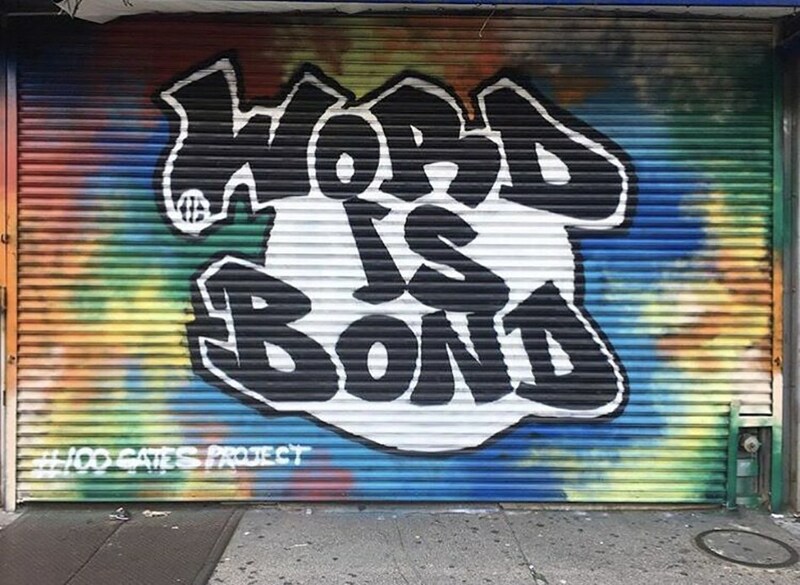 In 2017, the 100 Gates Project was awarded a grant from New York City Department of Small Business Service’s Neighborhood 360 program, to help support a pilot expansion of this community initiative, at which time the 100 Gates Project footprint expanded to included Staten Island and East Harlem. 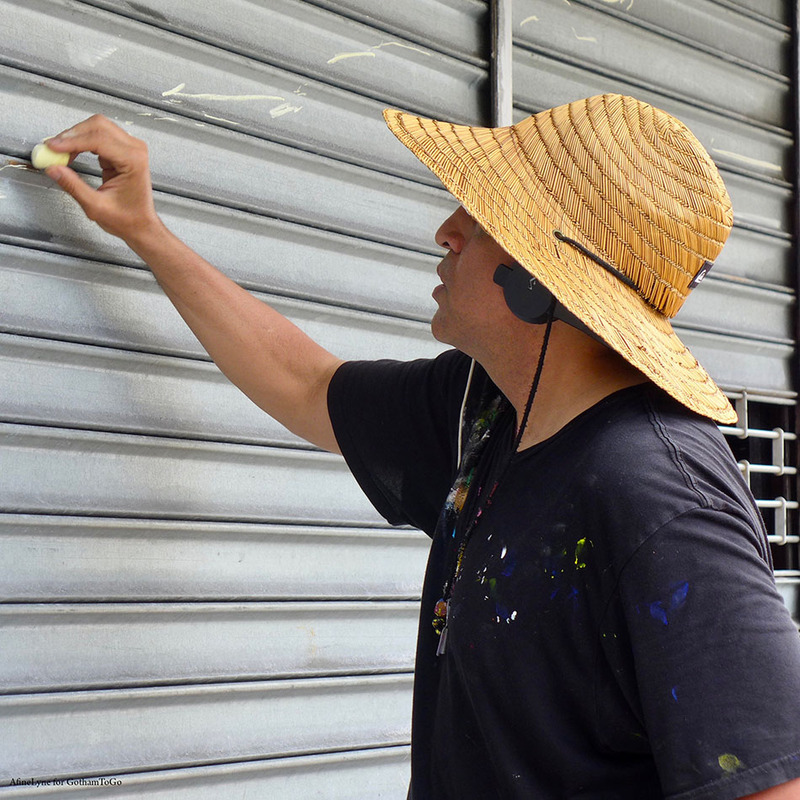 Painting began in the Summer of 2017. 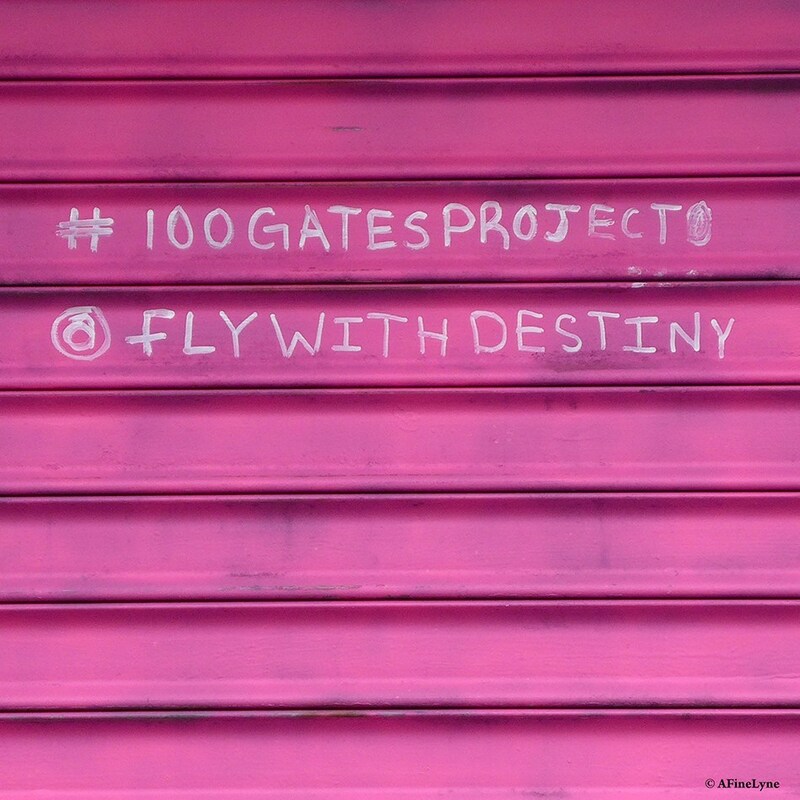 While all goals have been met, 100 Gates Project continues to connect local artists with local businesses. 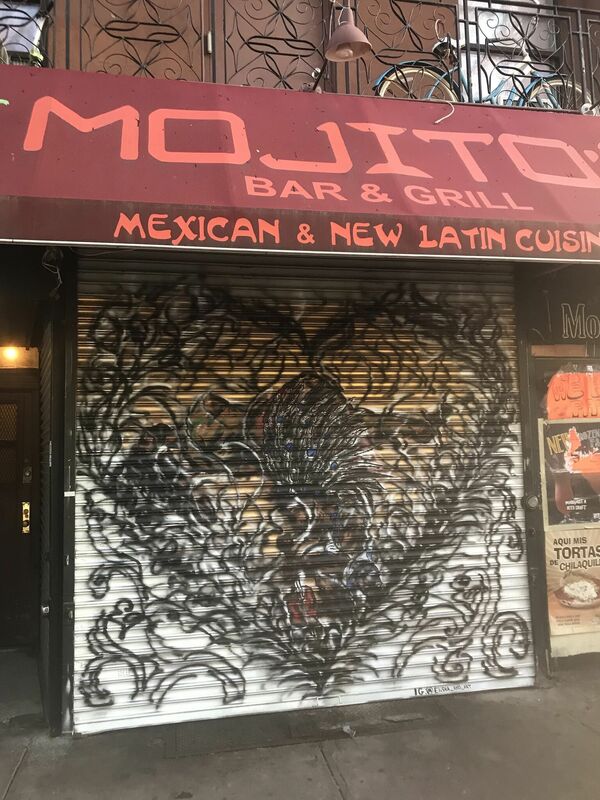 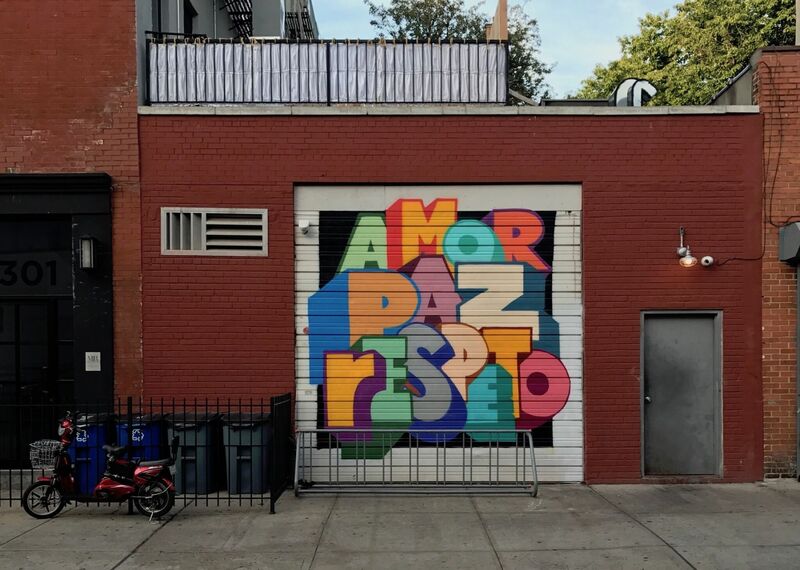 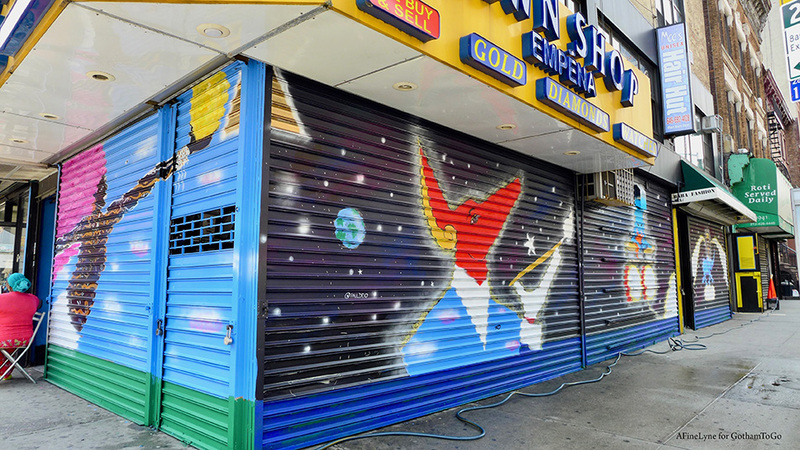 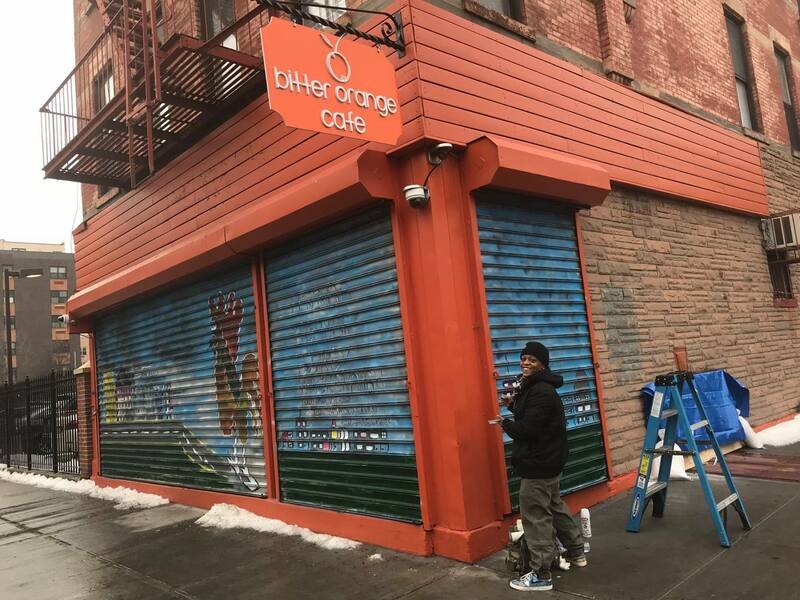 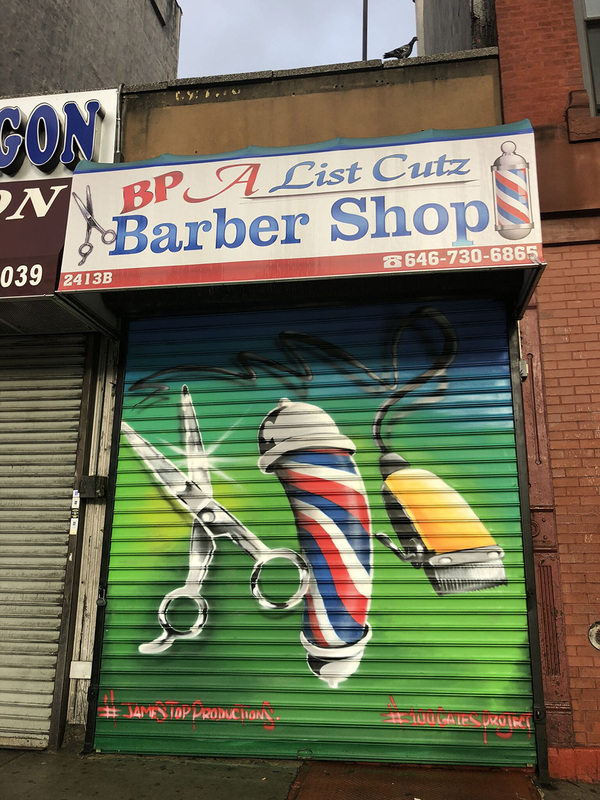 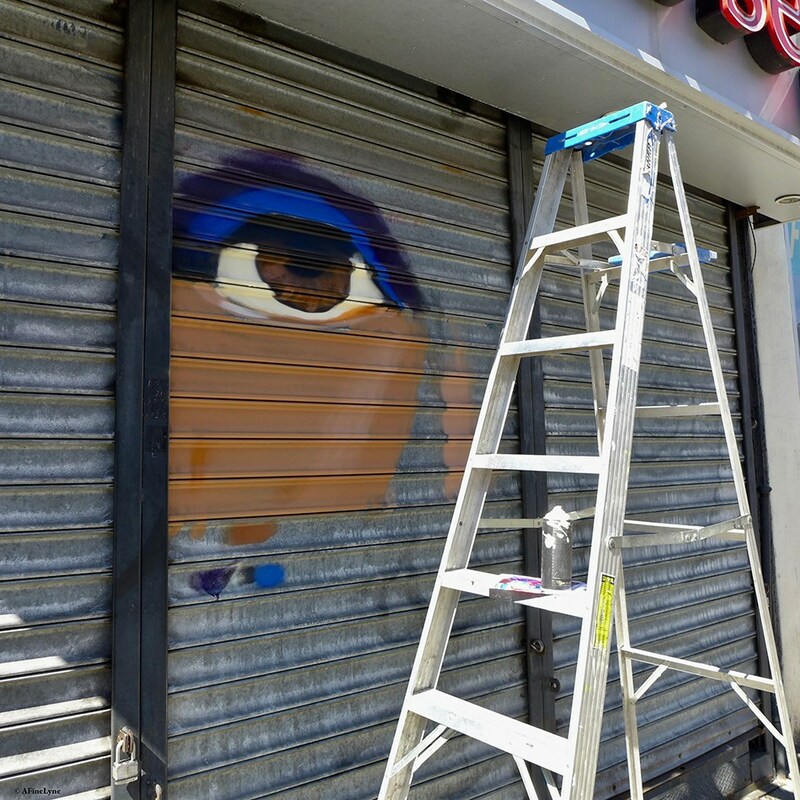 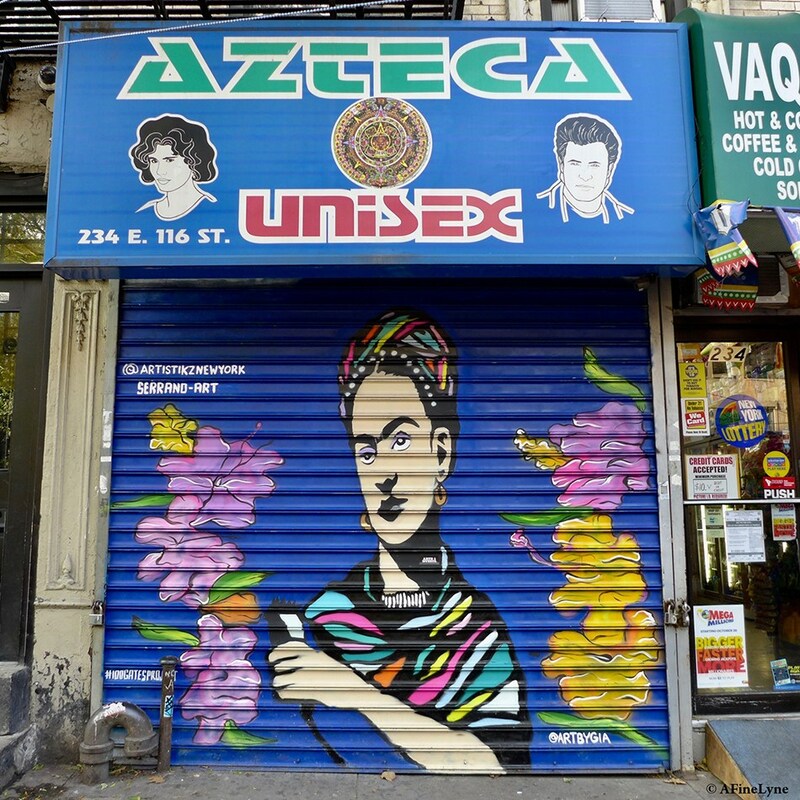 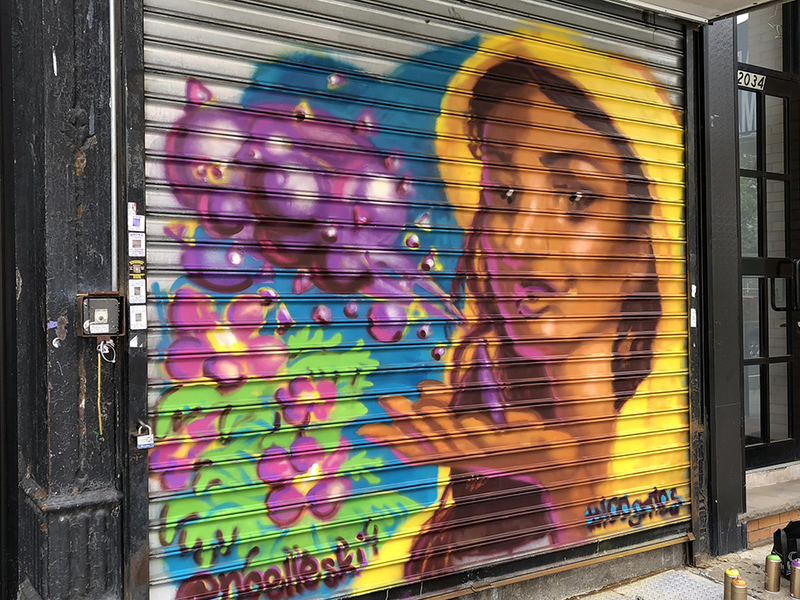 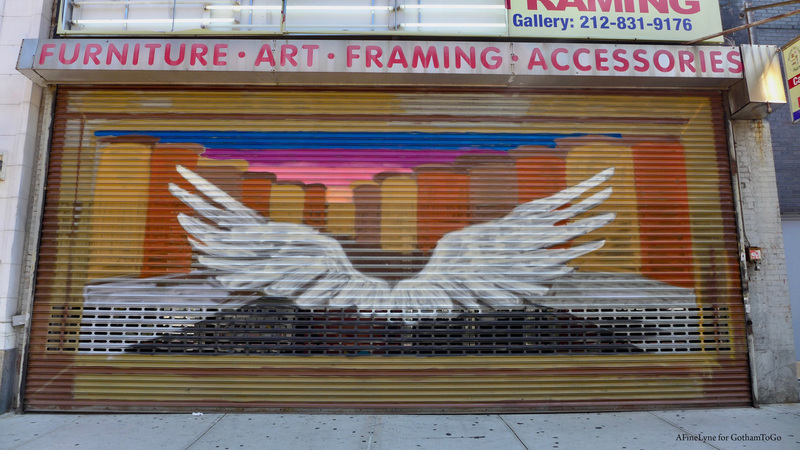 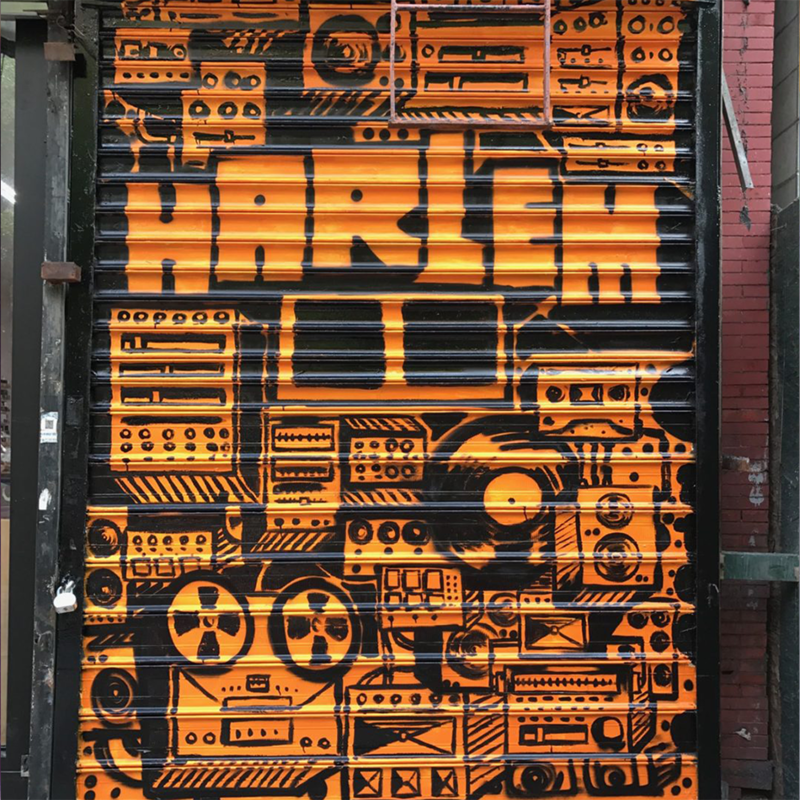 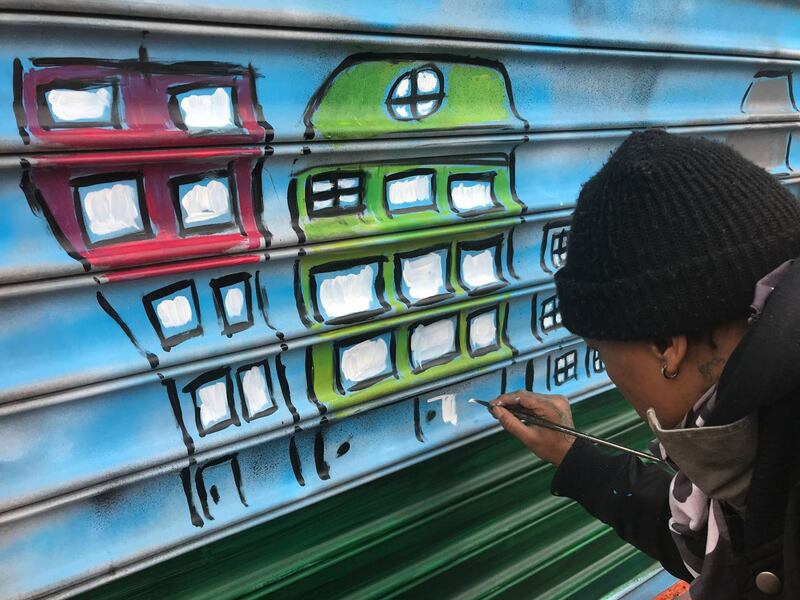 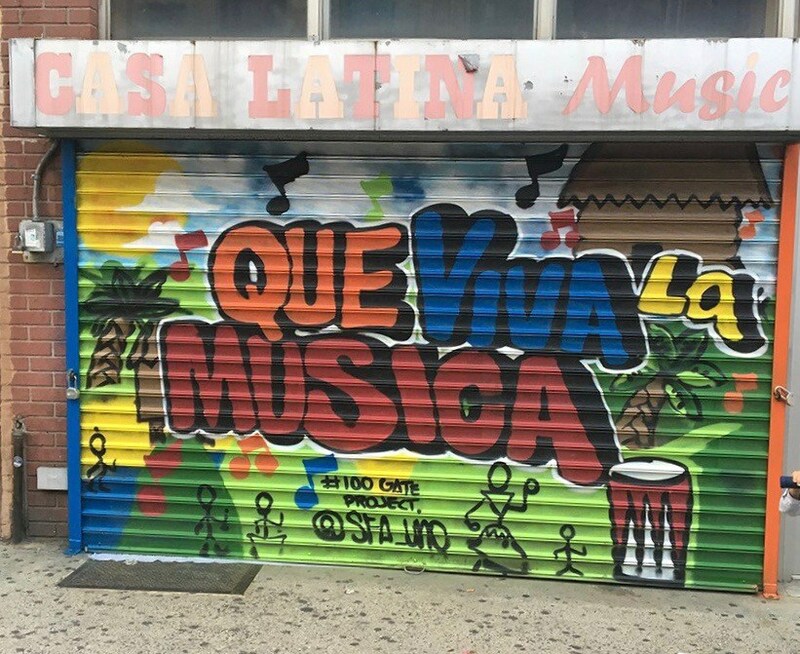 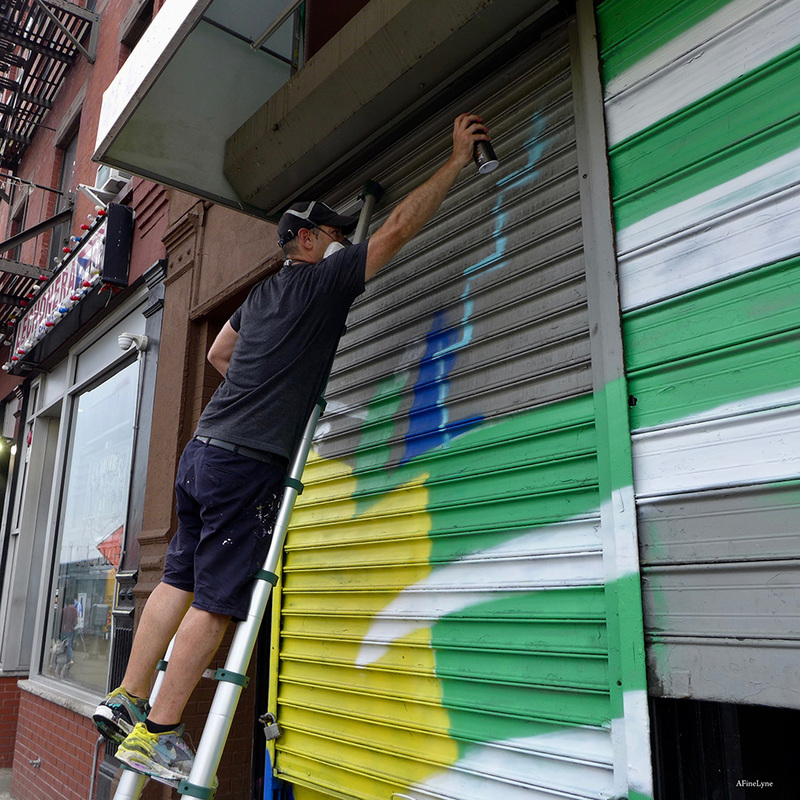 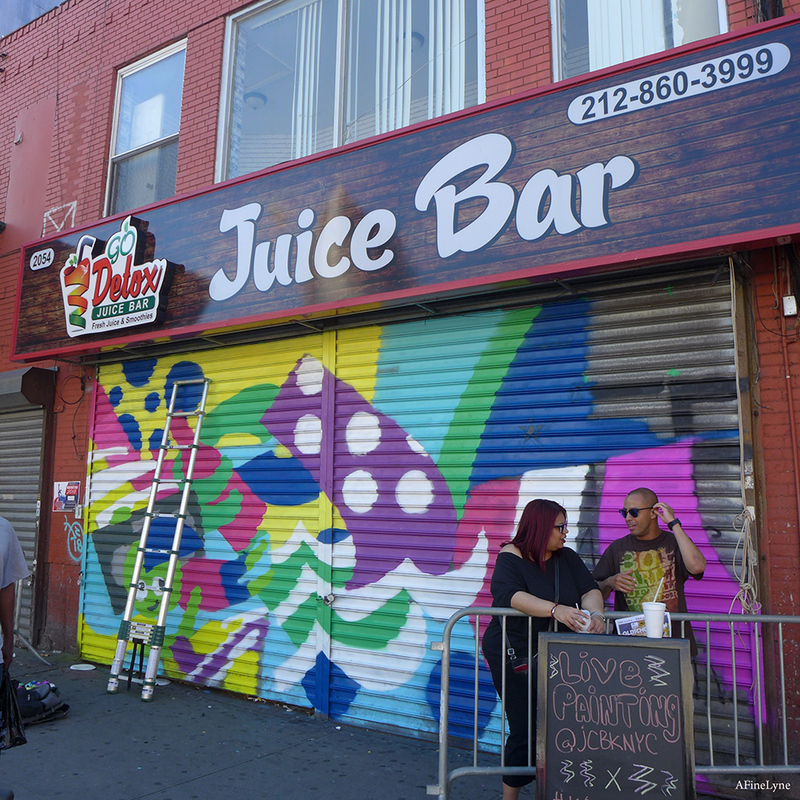 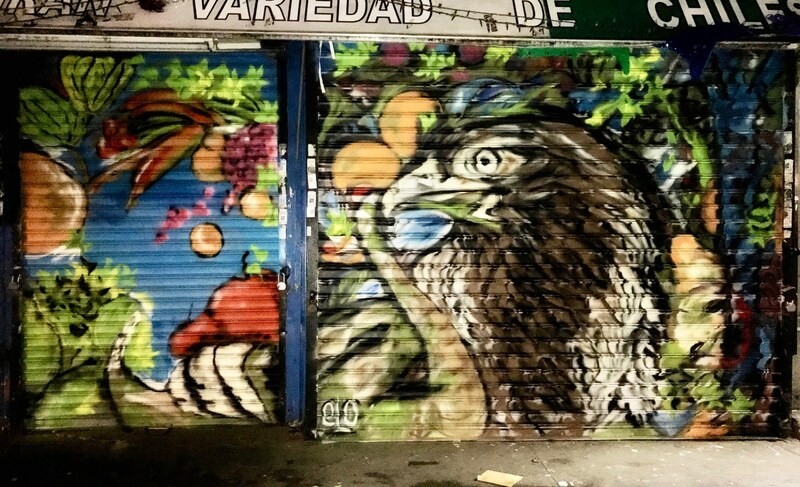 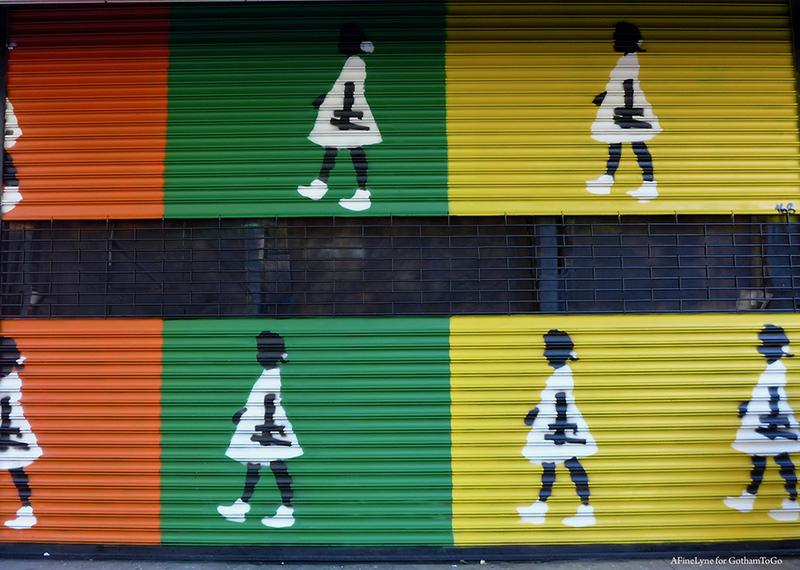 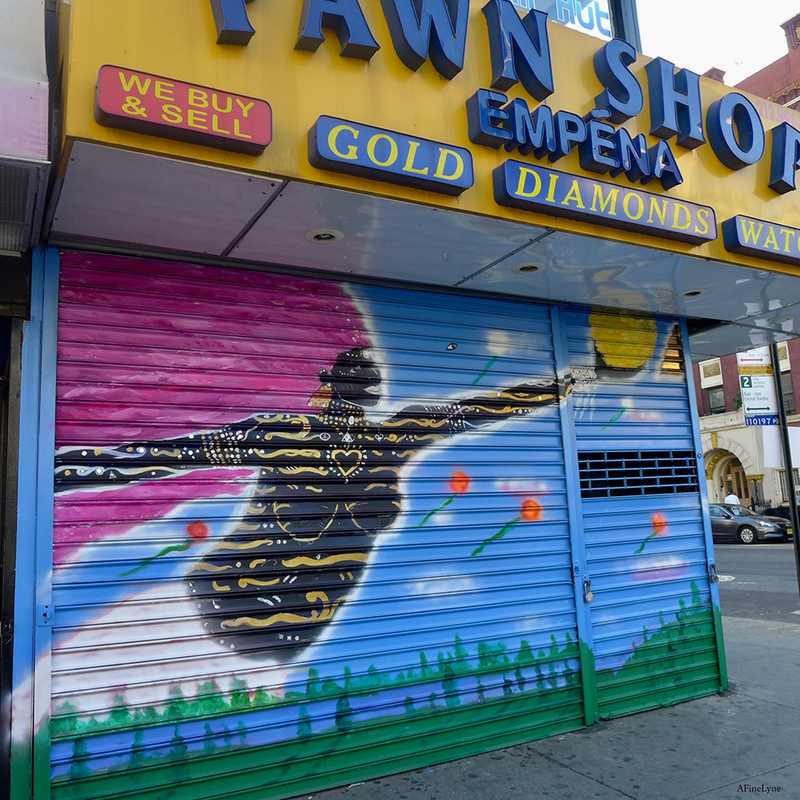 Below are images of the gates in East Harlem’s El Barrio, in celebration of reaching fifty painted gates, with the most recent gates painted first. 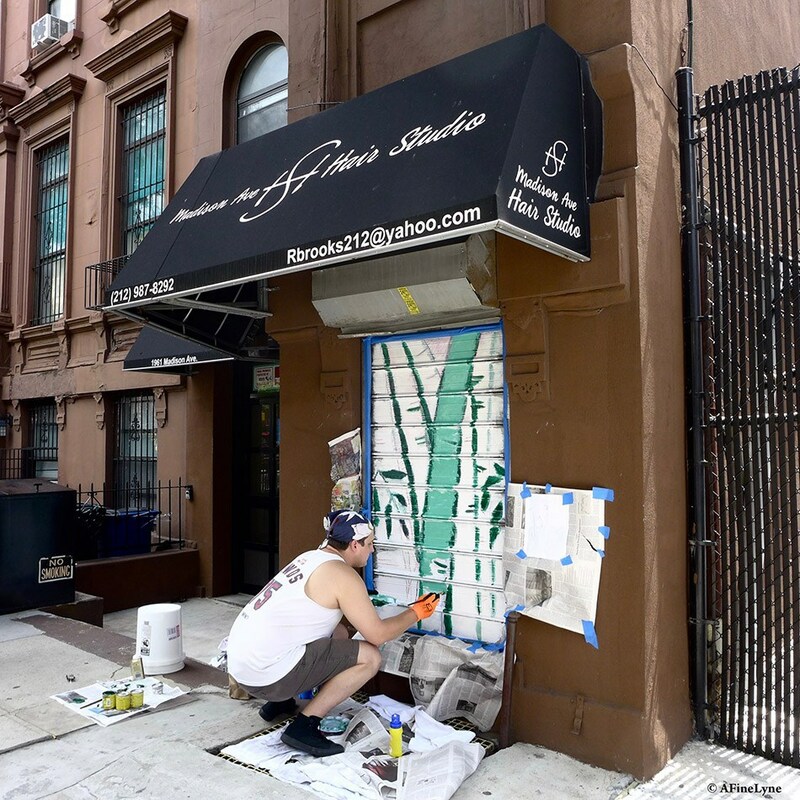 Works in progress will continue through September, 2018. 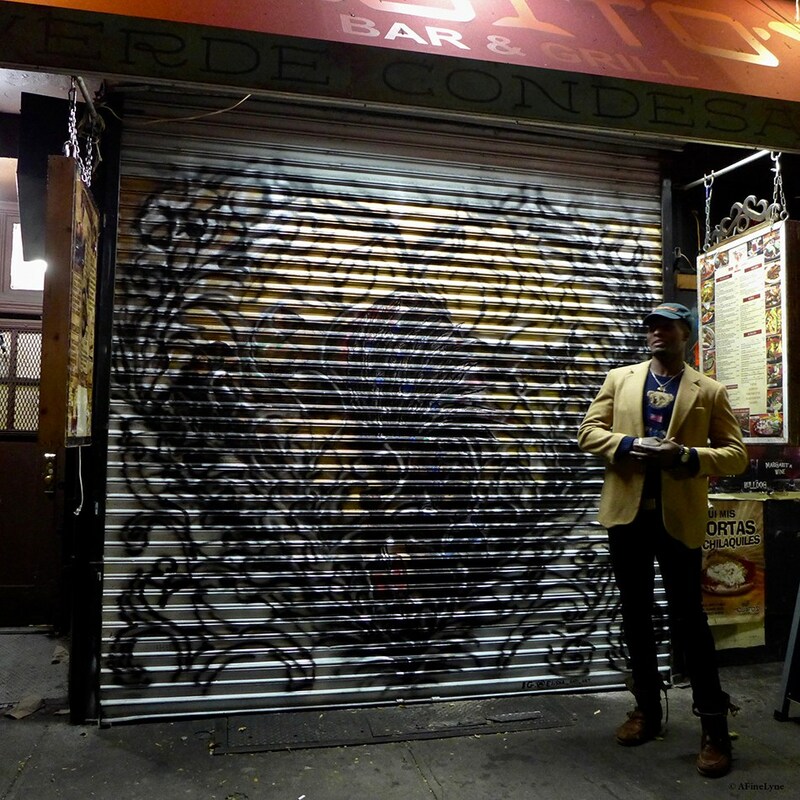 James Alicea (BlusterOne) ~ a native New Yorker ~ is a graphic designer, illustrator and letter enthusiast. 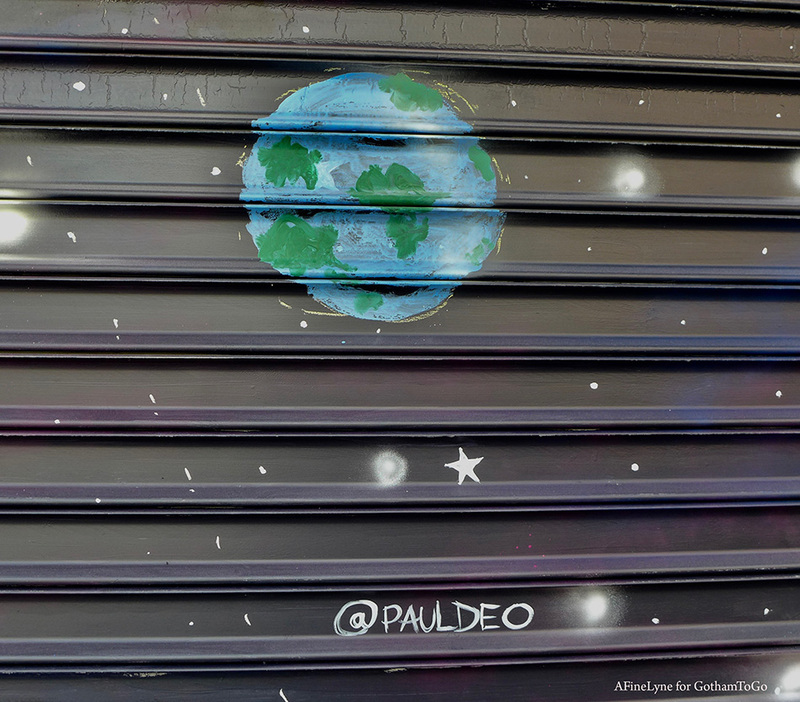 Follow Blusterone on Instagram. 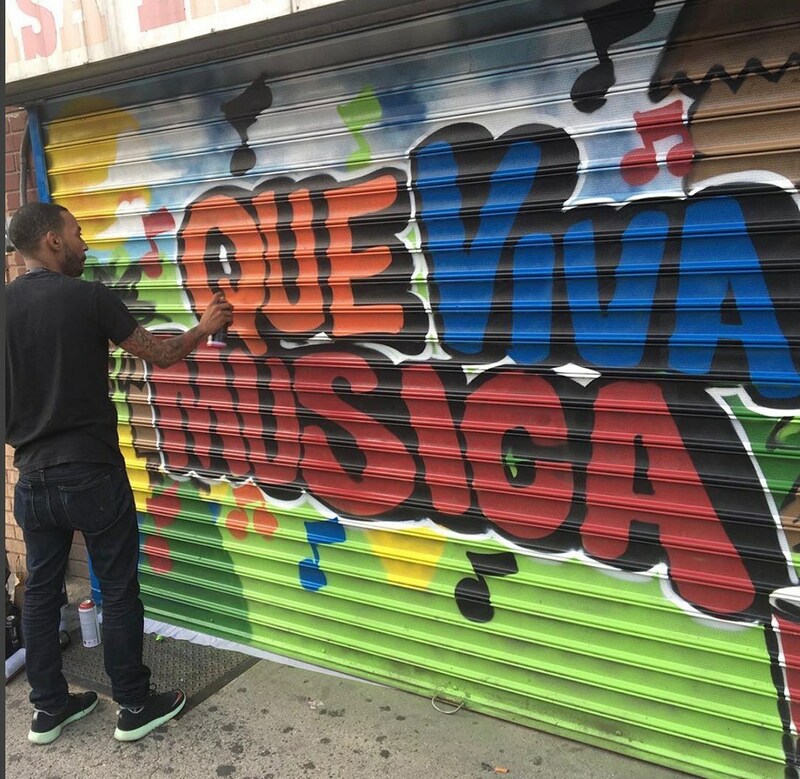 We know him as the Chief Executive Officer at James Top Productions and the gateway into The Graffiti Wall of Fame on 106th Street. 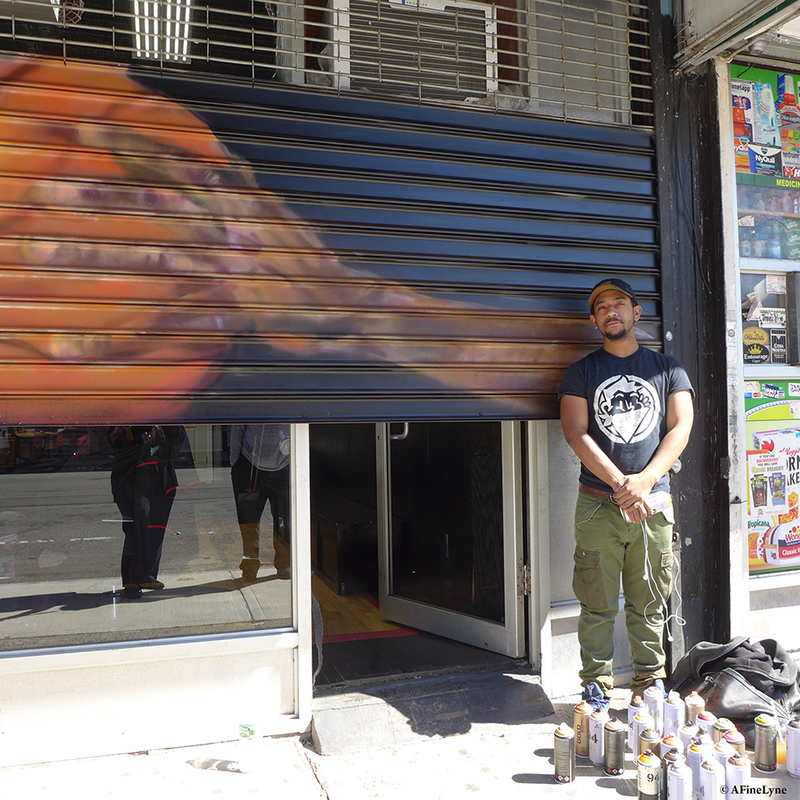 But today, he is the artist at Makana and Cutz. 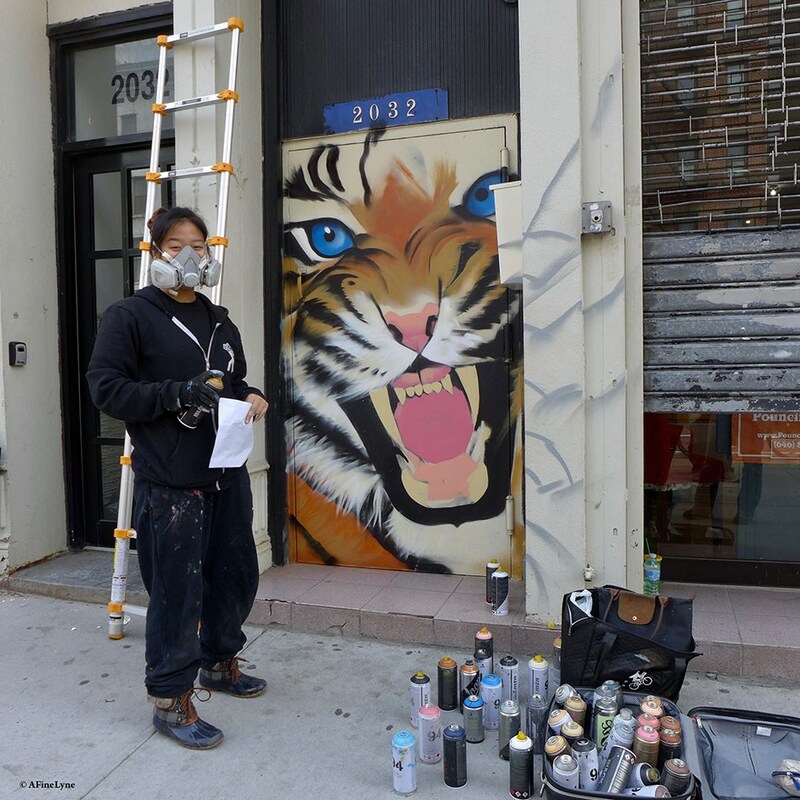 Follow James top on Facebook. 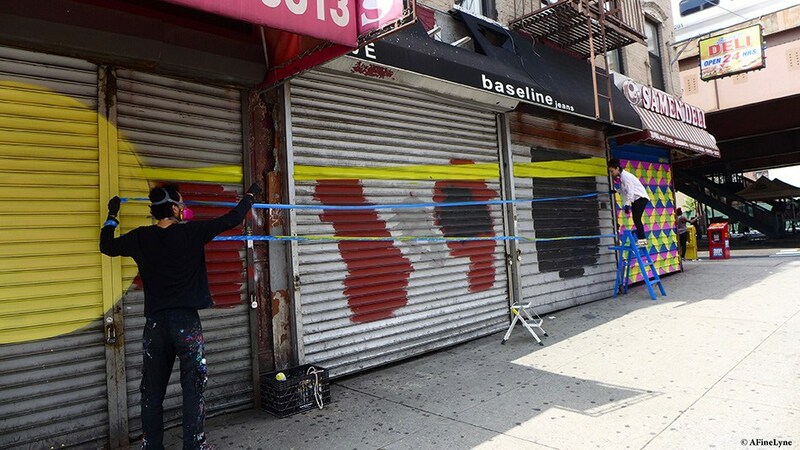 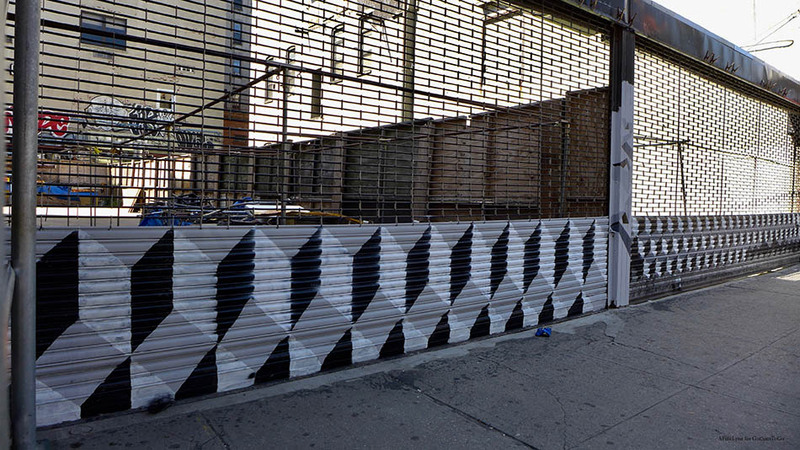 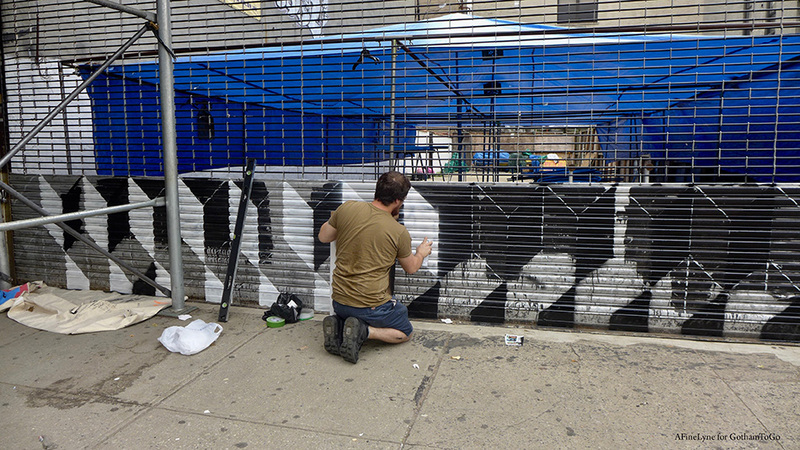 Artist, Andrew Harley beginning work on the gate covering the Bazaar Lot, next to 46 East 125th Street, and right behind a very busy bus stop. 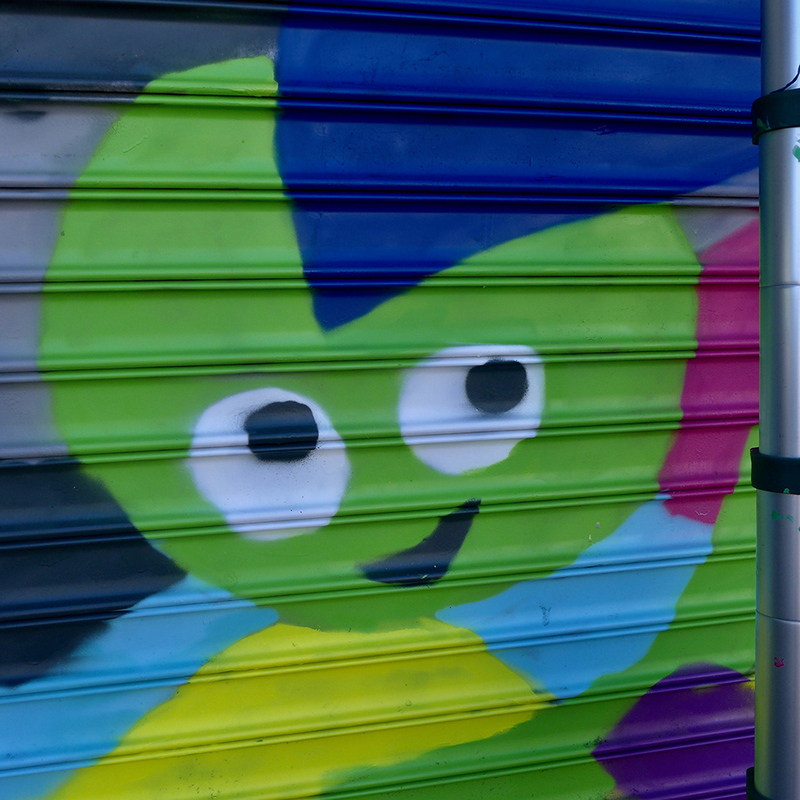 Lots of onlookers when we stopped by to say Hi! 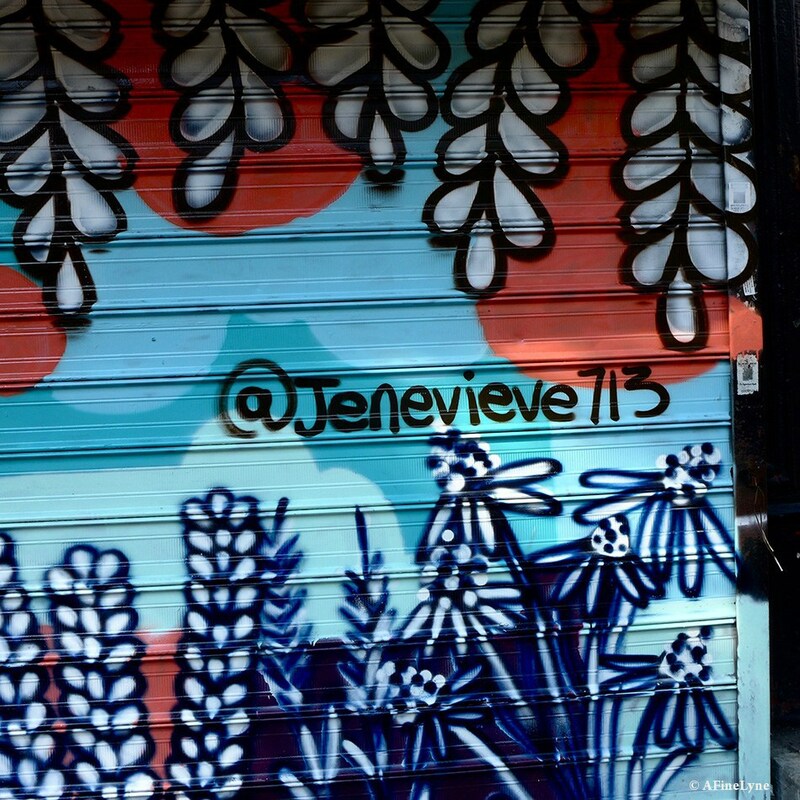 Follow along on Instagram & his fabulous website. 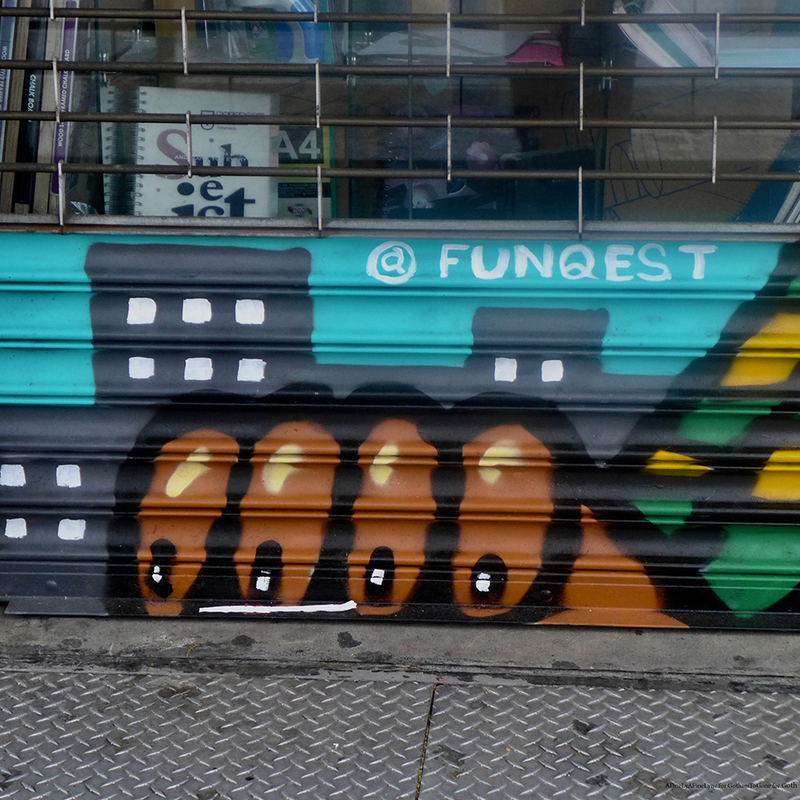 Noticing Funquest artwork all over town! 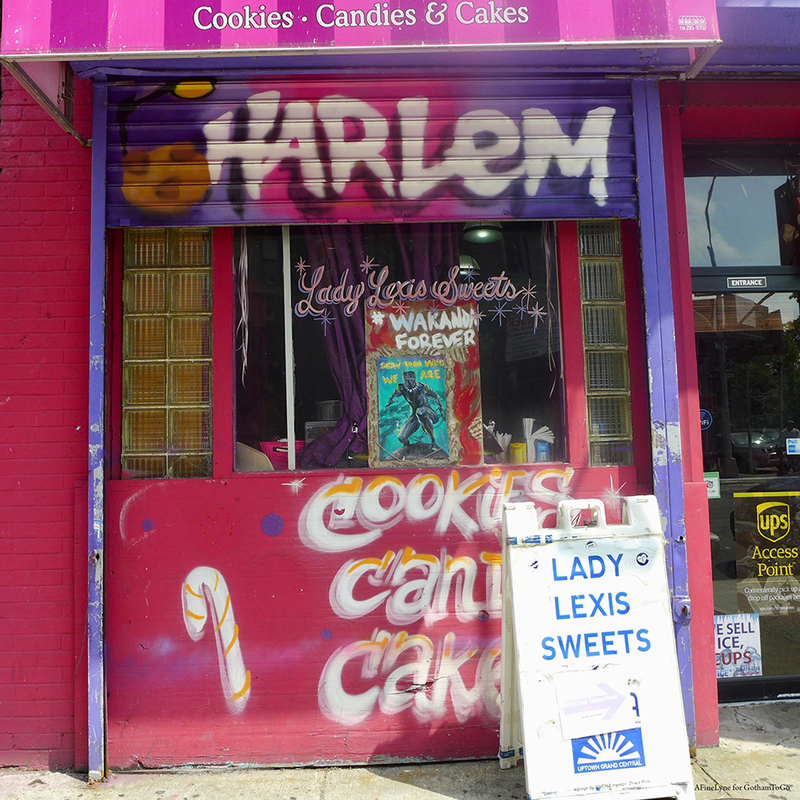 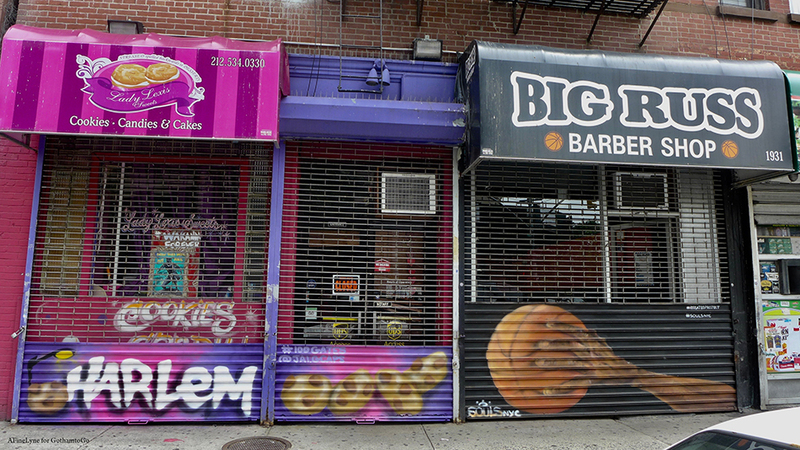 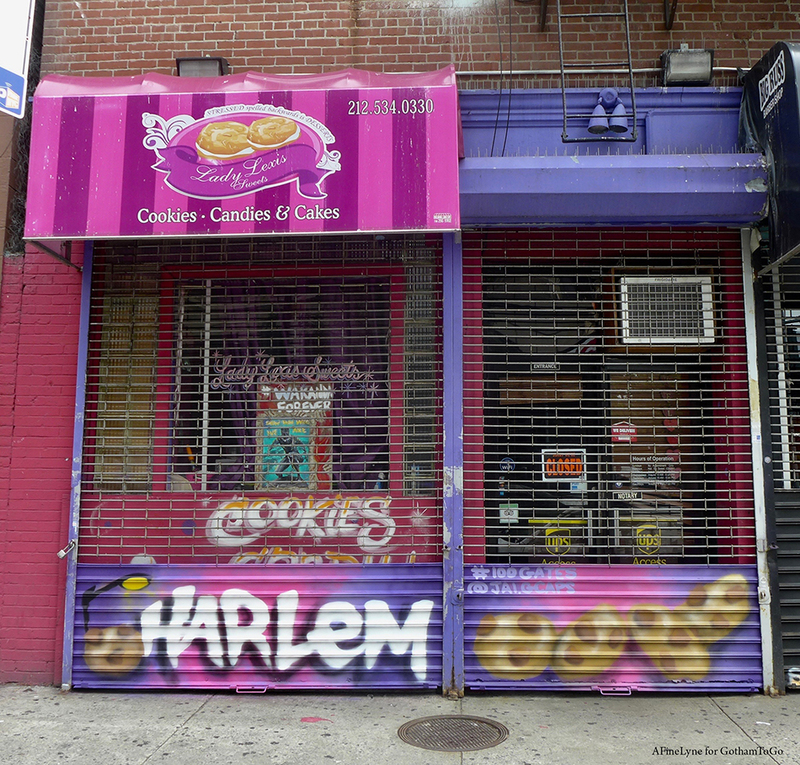 including another East Harlem gate, Direct Print in addition to one of our favorite East Harlem Bakery’s ~ La Tropezienne. 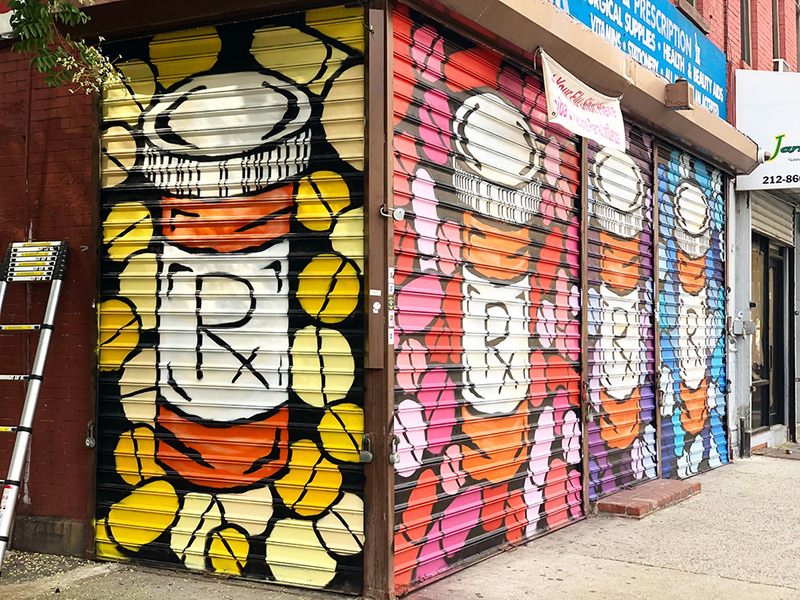 Corner gates for this popular pharmacy, RX Center. 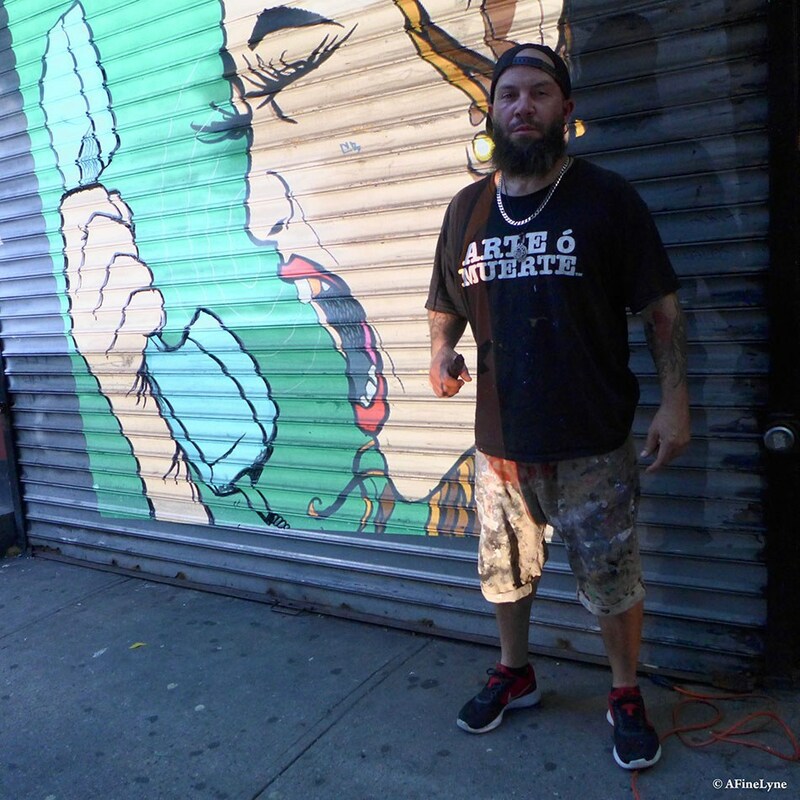 Follow the artist, Dirt Cobain @dirtcobain one Instagram. 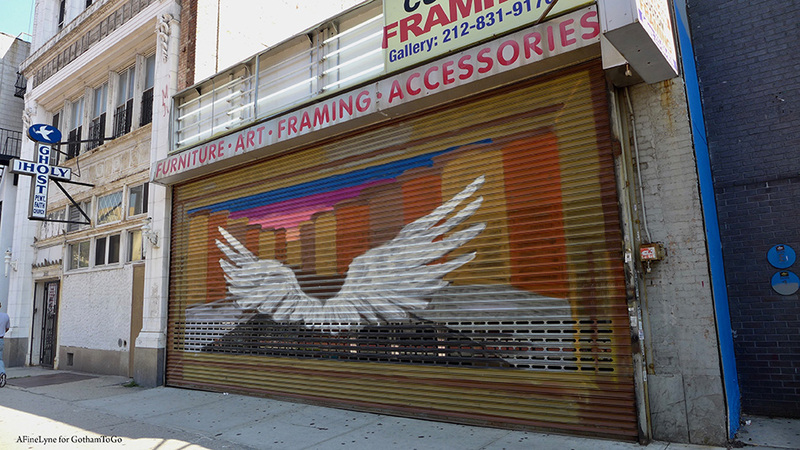 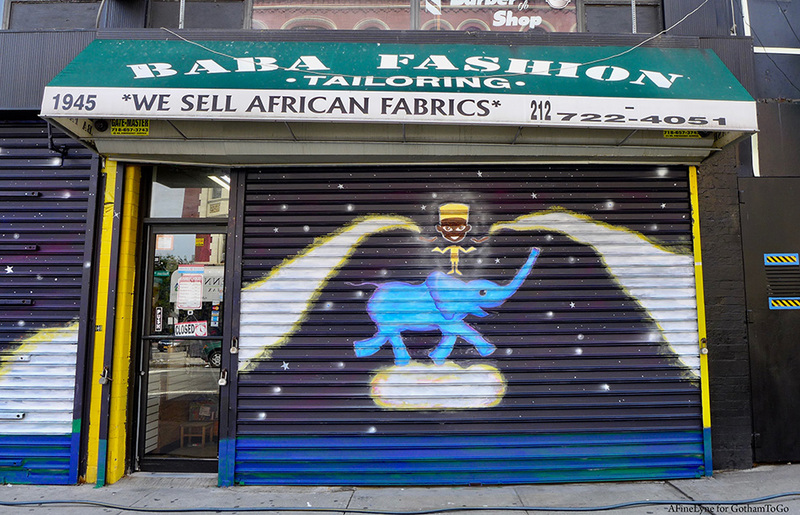 The popular Sword Class, located on Madison Avenue between 124/125th Streets is sporting a perfect gate by artist, Kumasi Barnett. 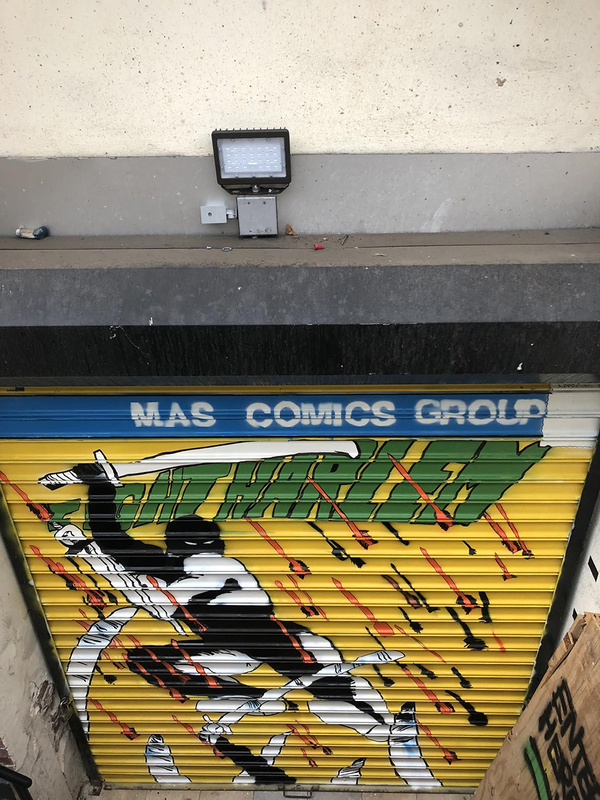 If you love comics, you’ll love this gate. 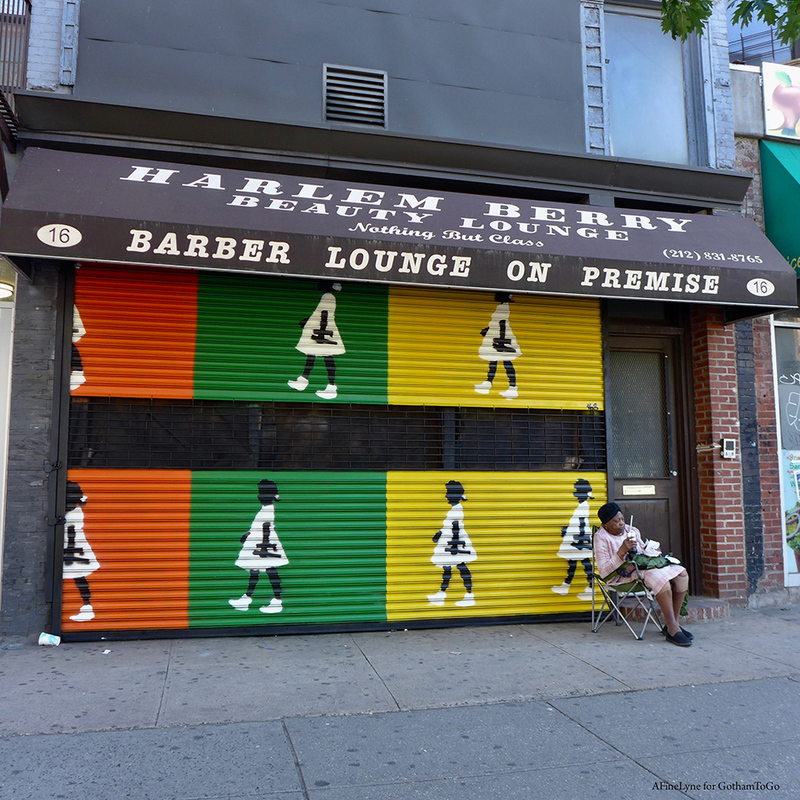 Harlem Berry Beauty Lounge sports the work of Sharon Lee De La Cruz, who is Assistant Director of The Studio Lab, a creative tech lab at Princeton University. 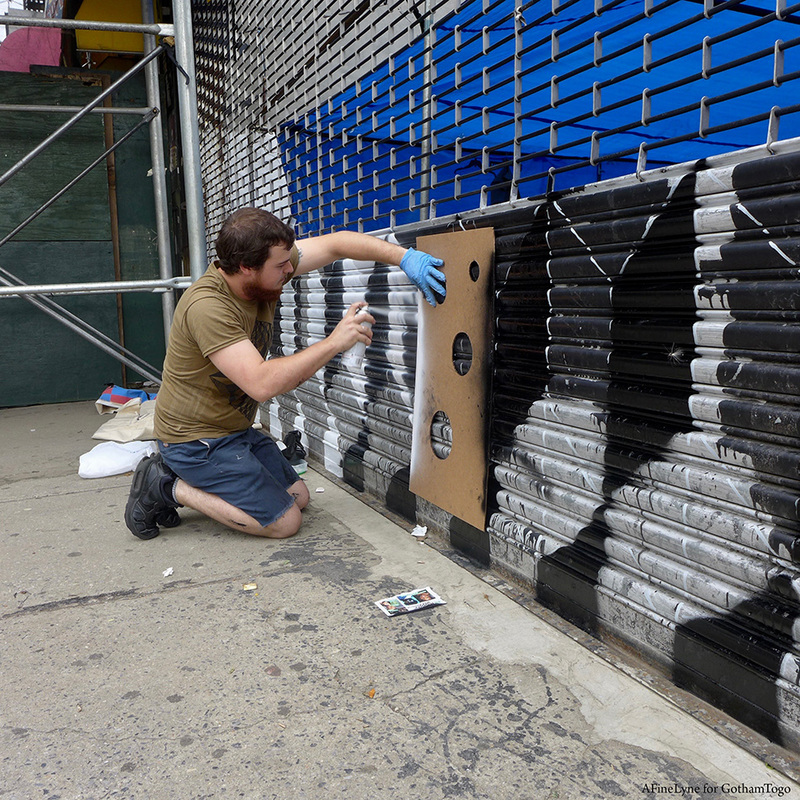 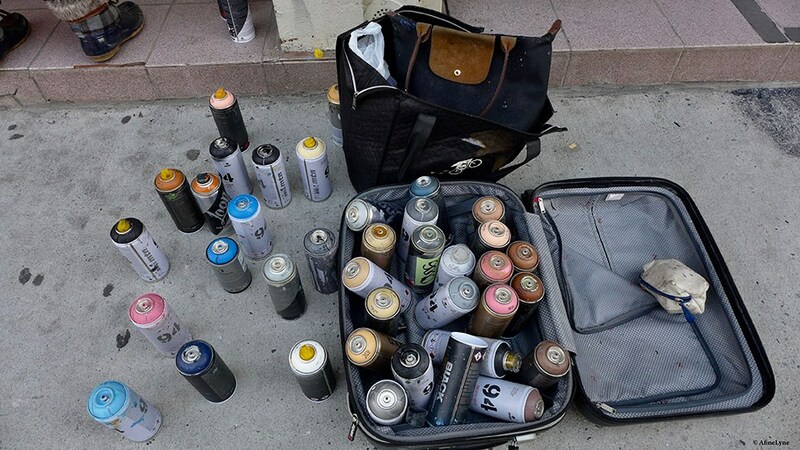 Here, we ask the question ~ do #StreetArtists ever sleep? 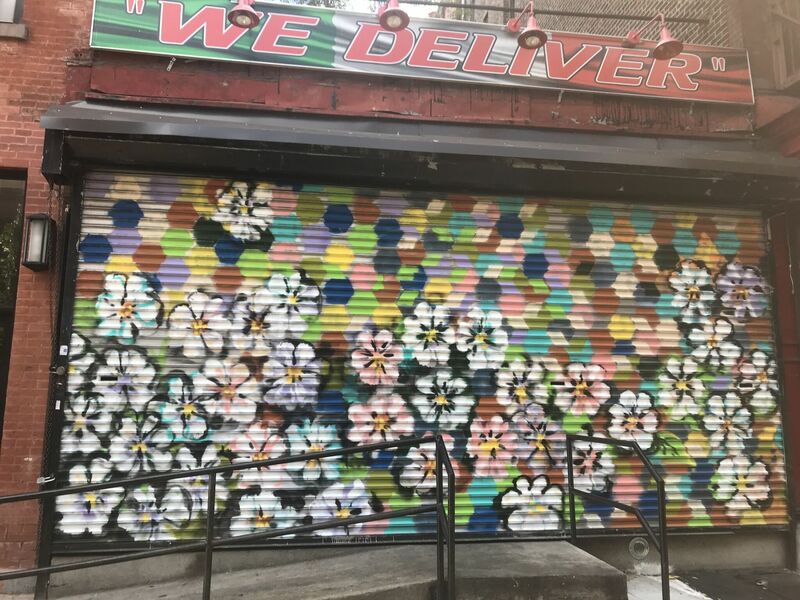 We just missed the well-known (highly elusive) John Carr @jcbknyc on East 125th Street this morning, where he is brightening up everything east of 246 East 125th Street, between Third/Second Avenues. 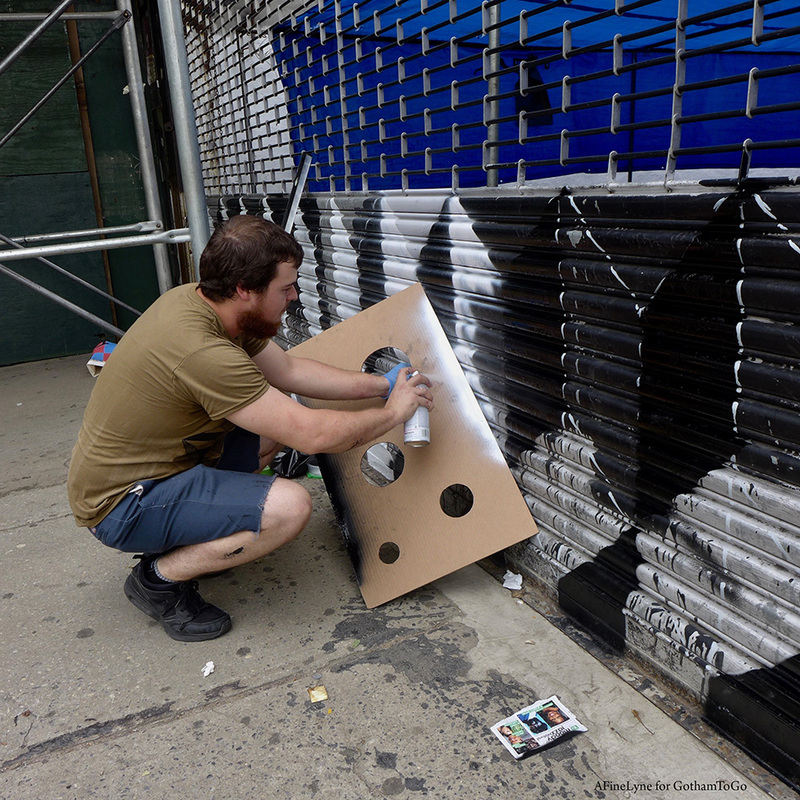 You’ll need a skateboard to follow him, on Instagram & Facebook as we continue to follow @jcbknyc downtown at the #MuralProject, which is also ongoing. 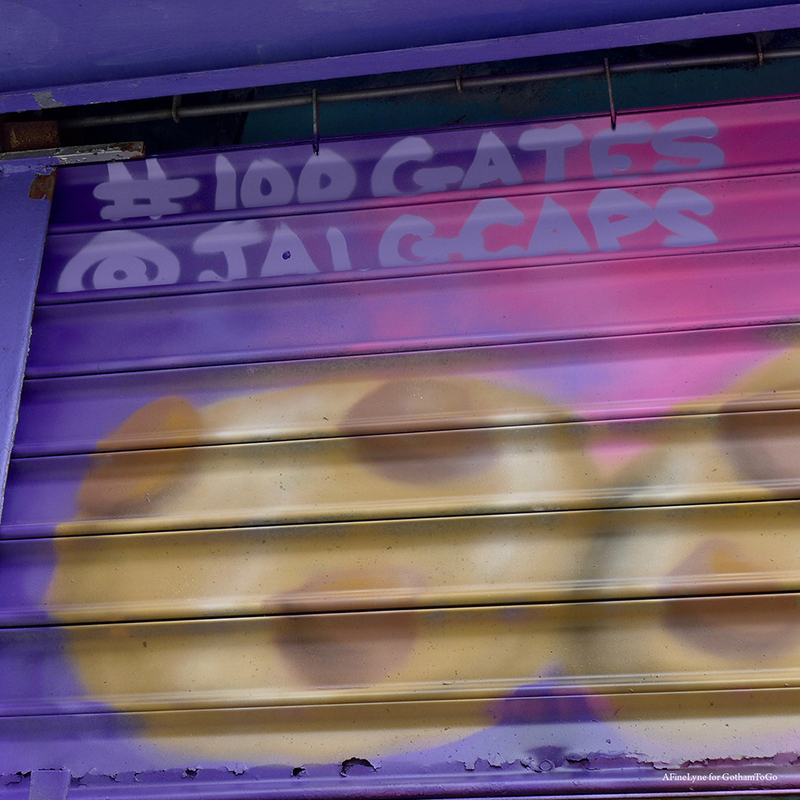 JCBKNYC for #100Gates ~ Found him! 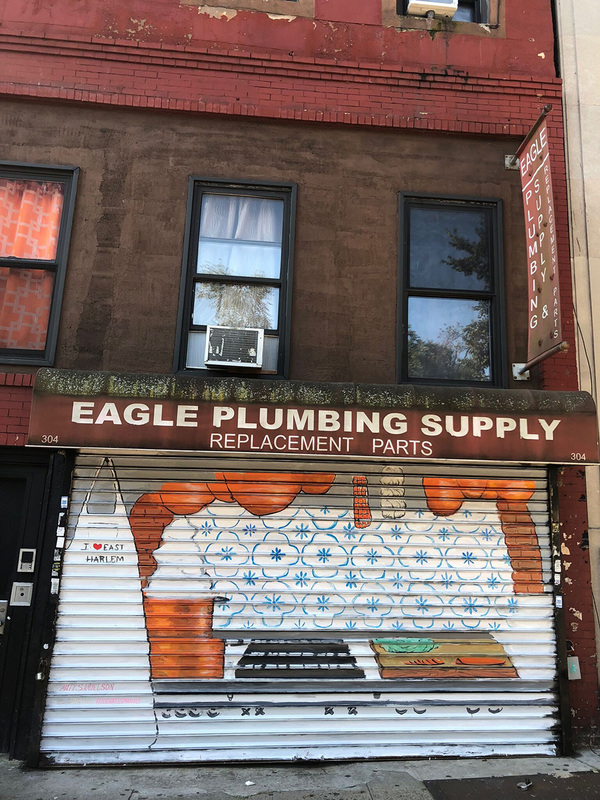 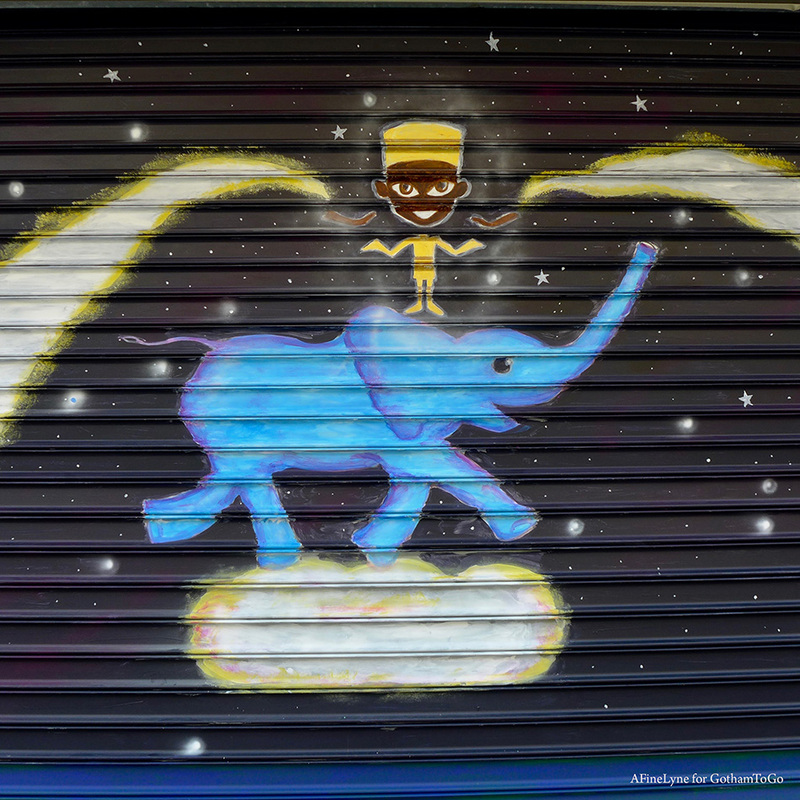 Carr’s artwork is on a part of East 125th Street where numerous construction projects are in the works, and is also on a block that houses our favorite salvage shop, Demolition Depot. 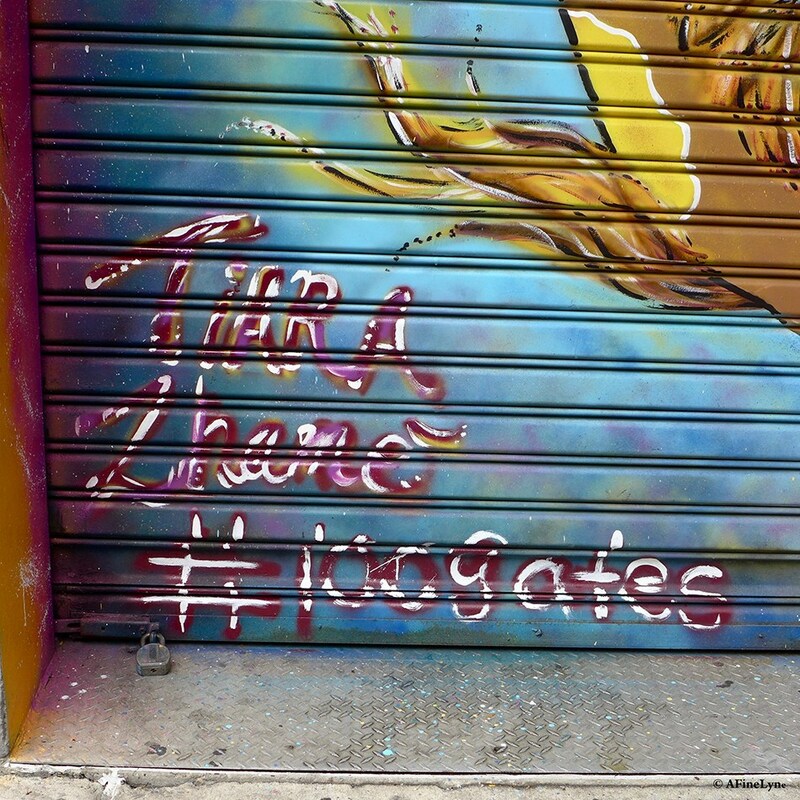 Here’s the ultimate #100GatesProject Selfie-Spot! 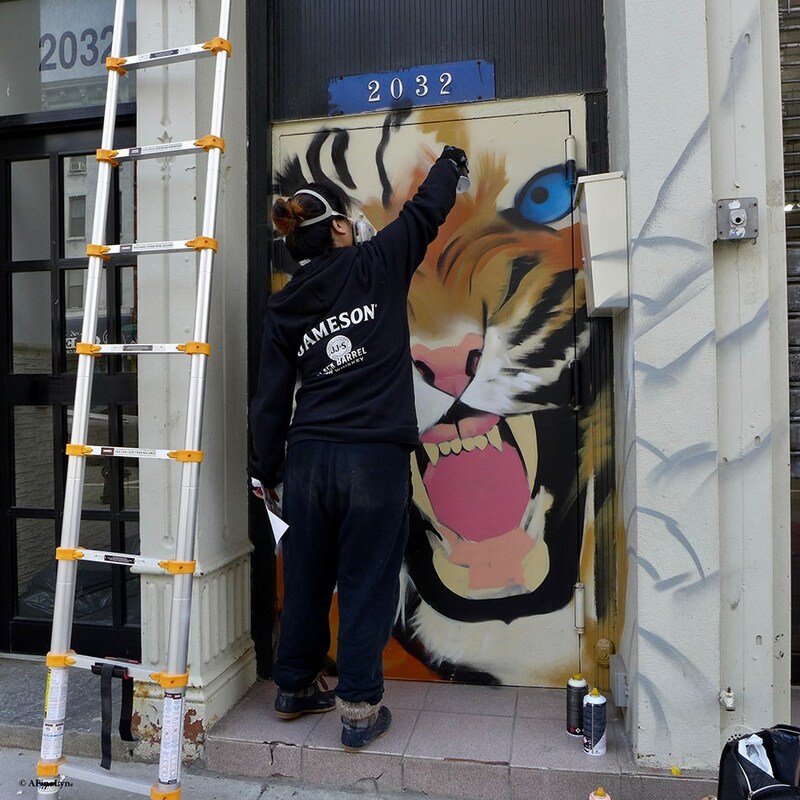 Artist #ANJL Follow her on Instagram + Facebook. 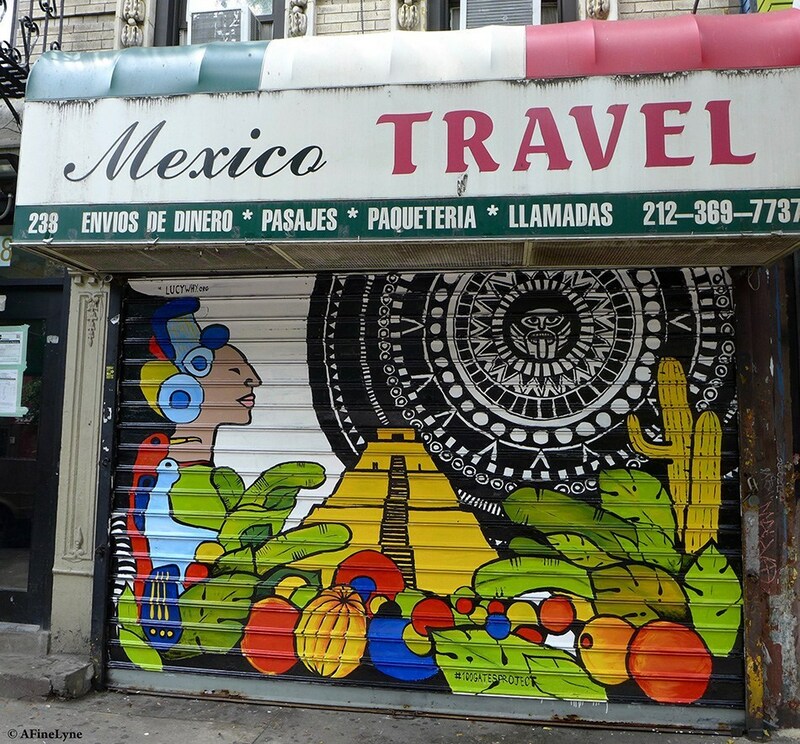 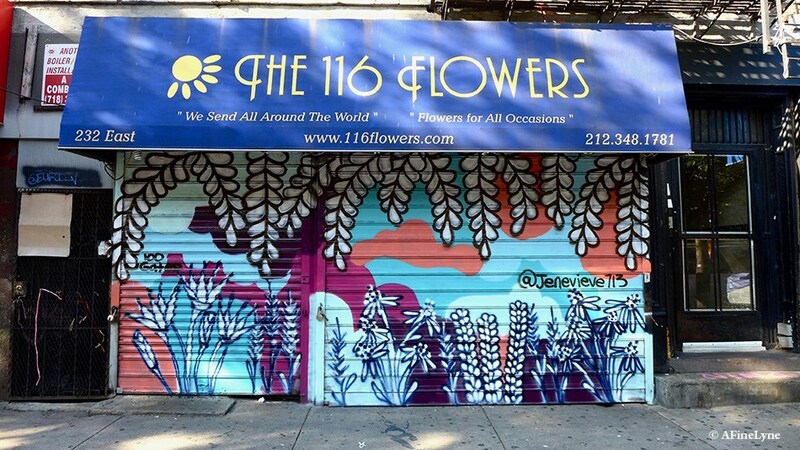 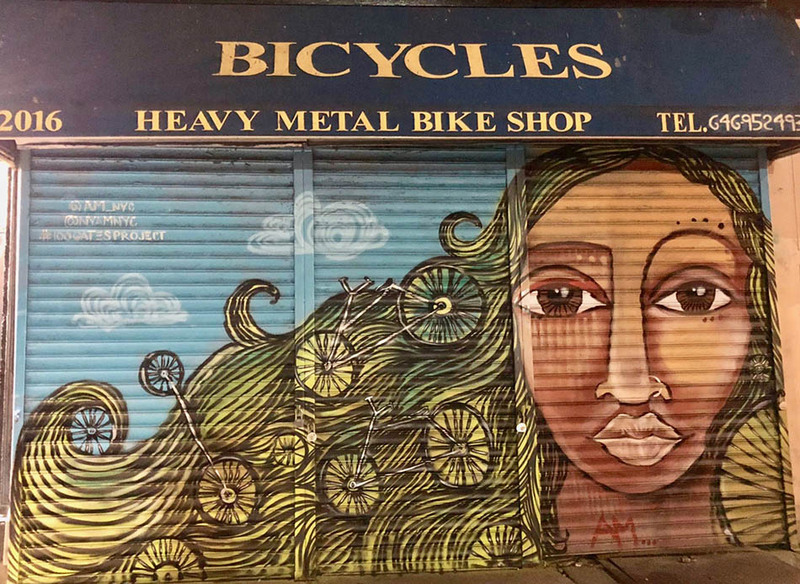 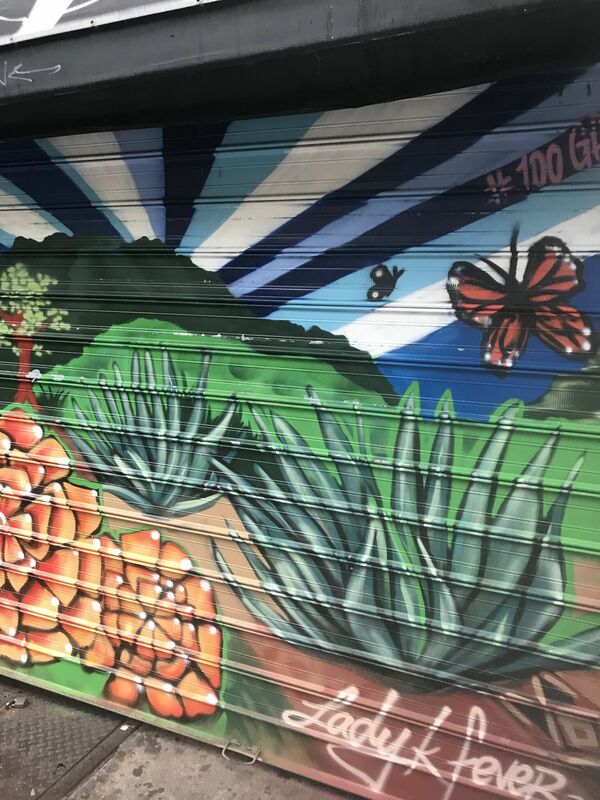 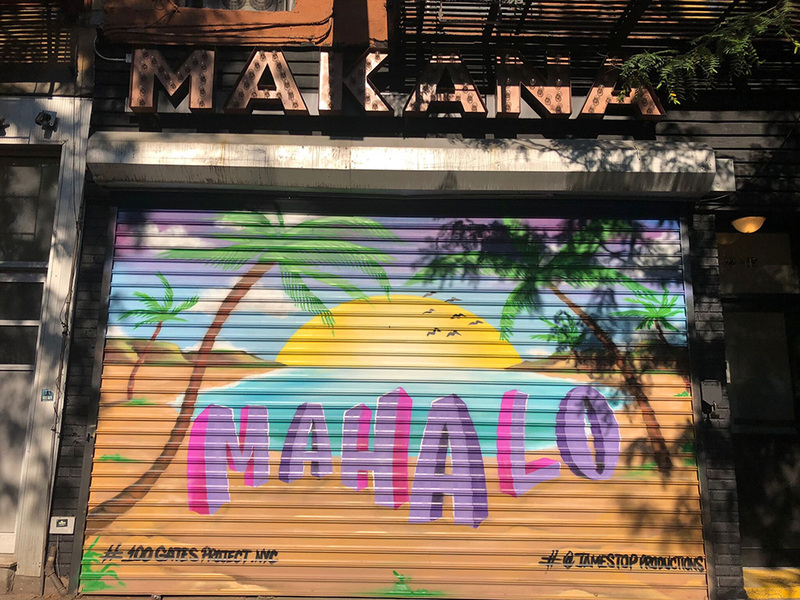 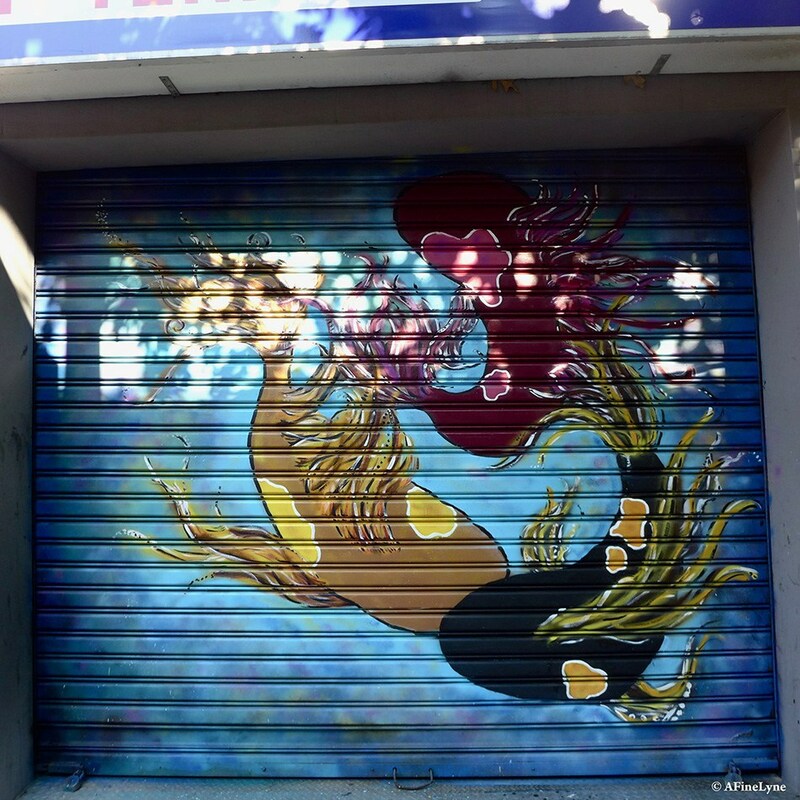 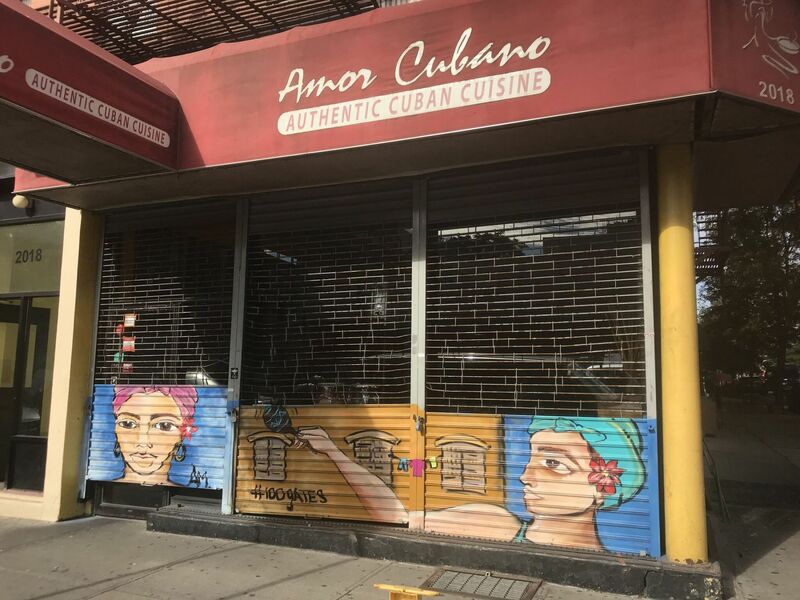 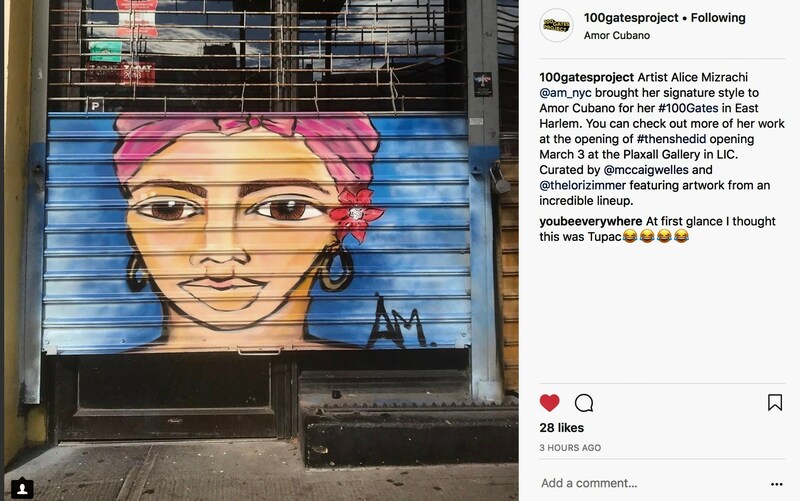 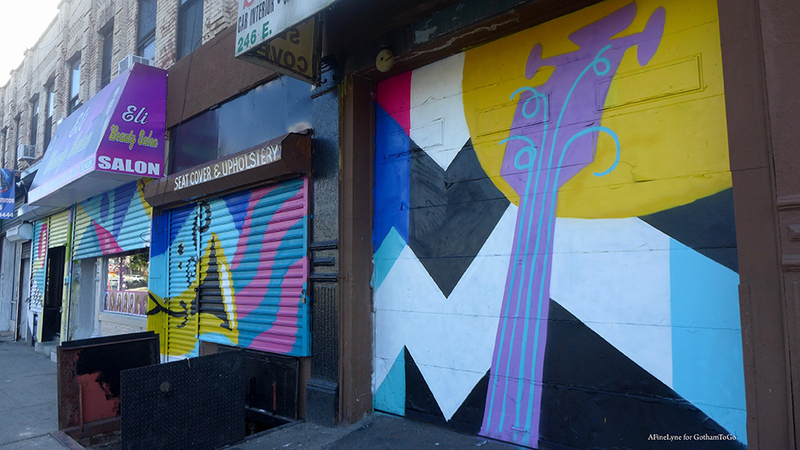 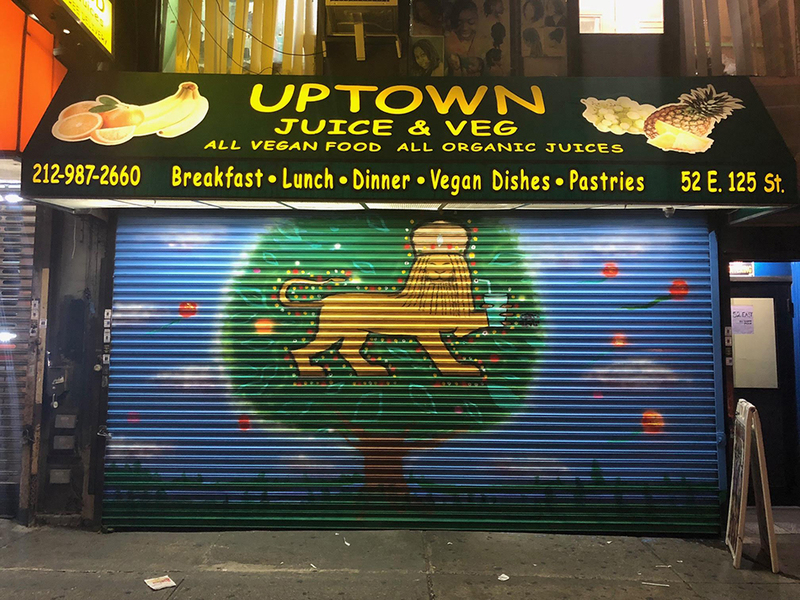 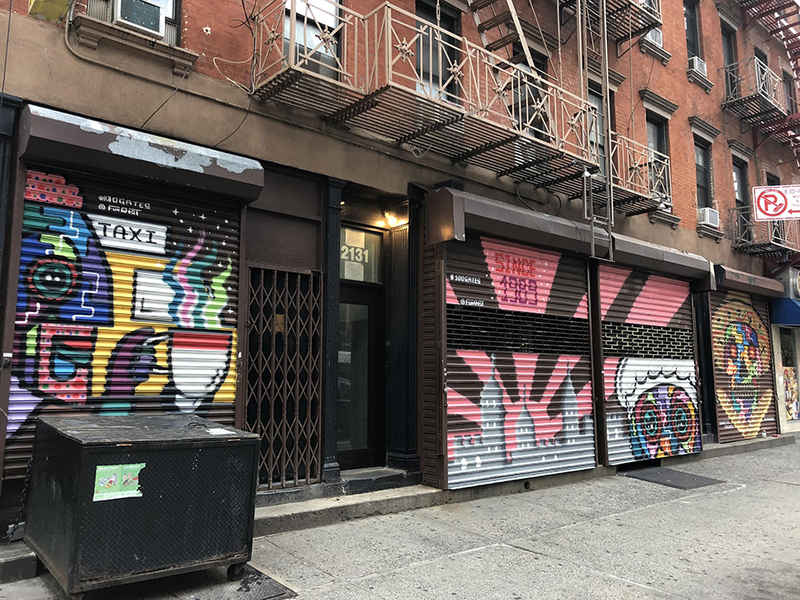 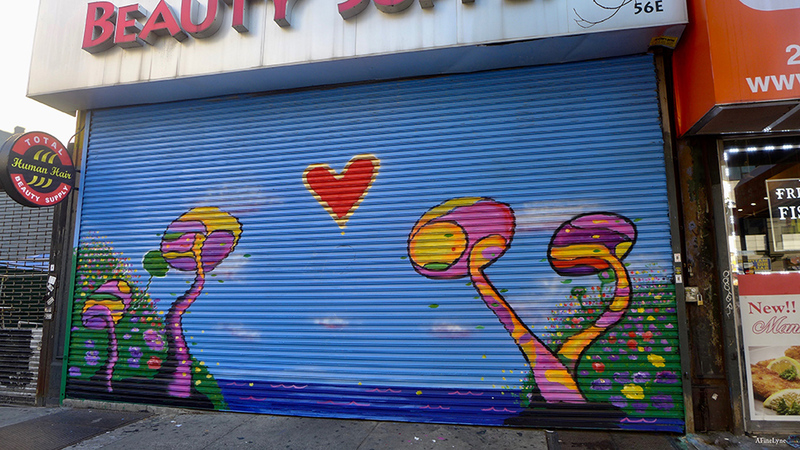 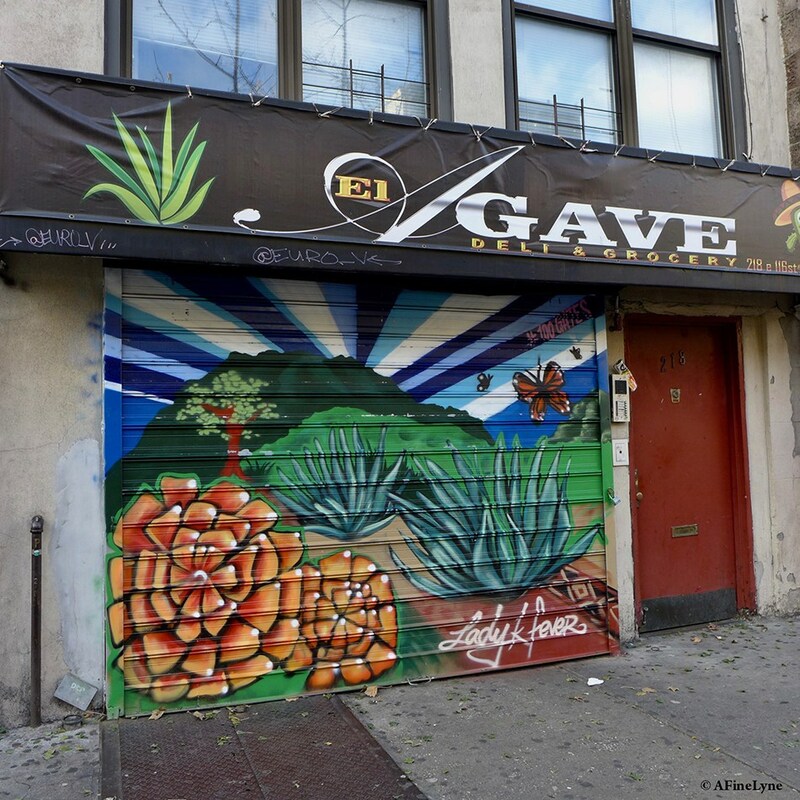 This is the second gate painted by Alice Mizrachi for the #100GatesProject in East Harlem ~ the first gate painted at Amor Cubano, one block away on 111th Street. 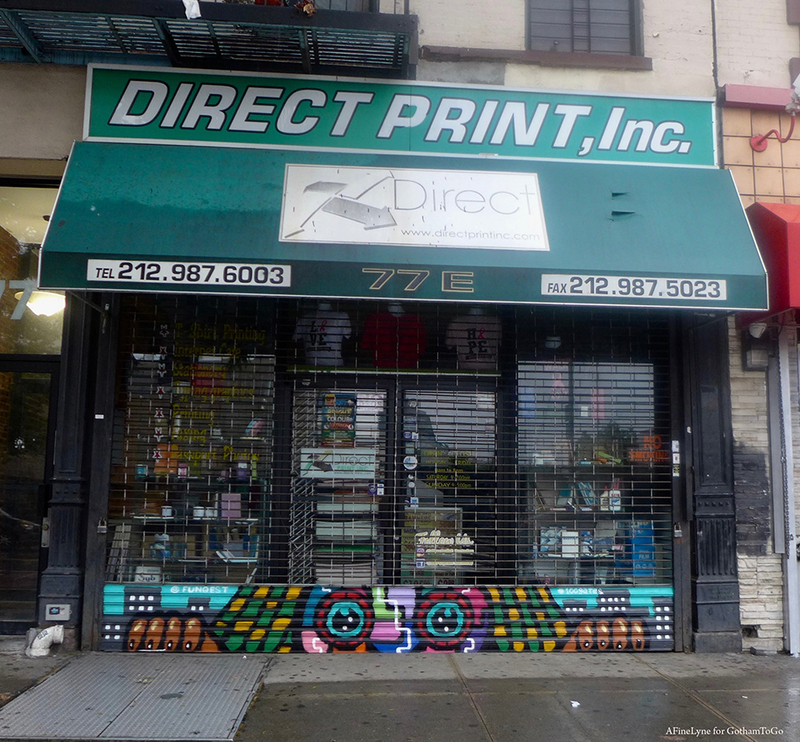 As if peeking at pedestrians on their way to the train, #Funqest at Direct Print on East 125th Street. 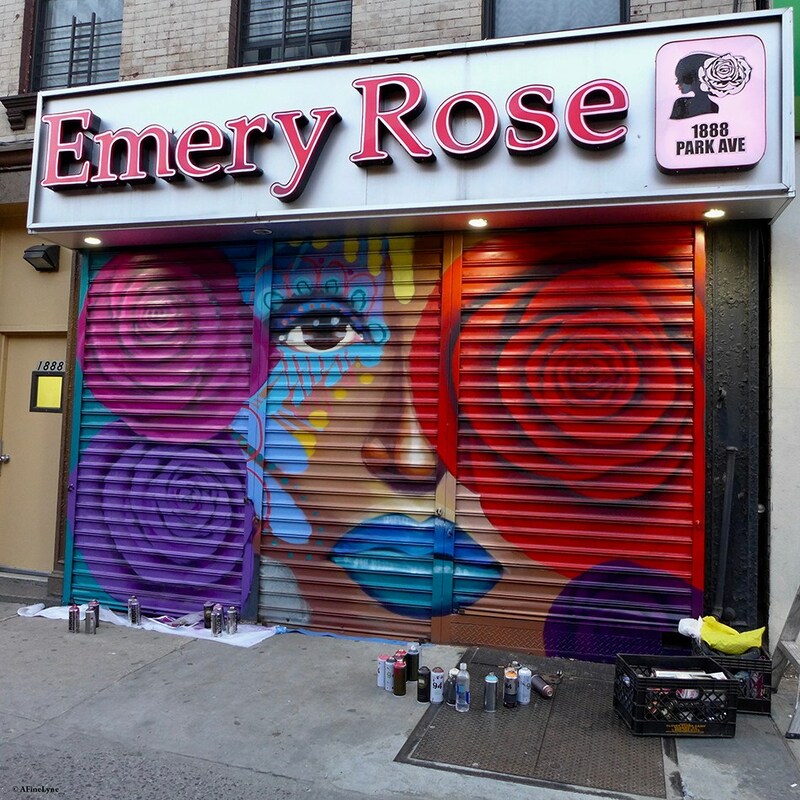 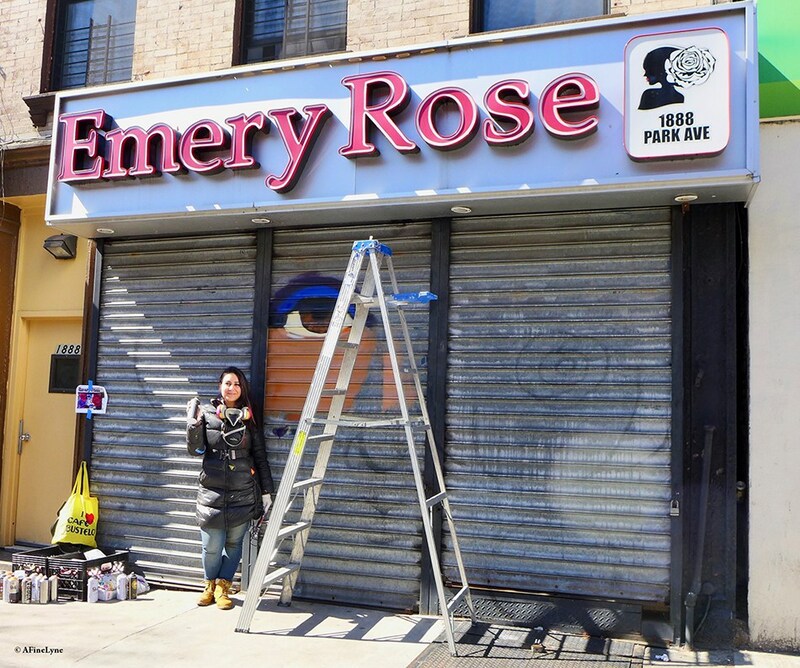 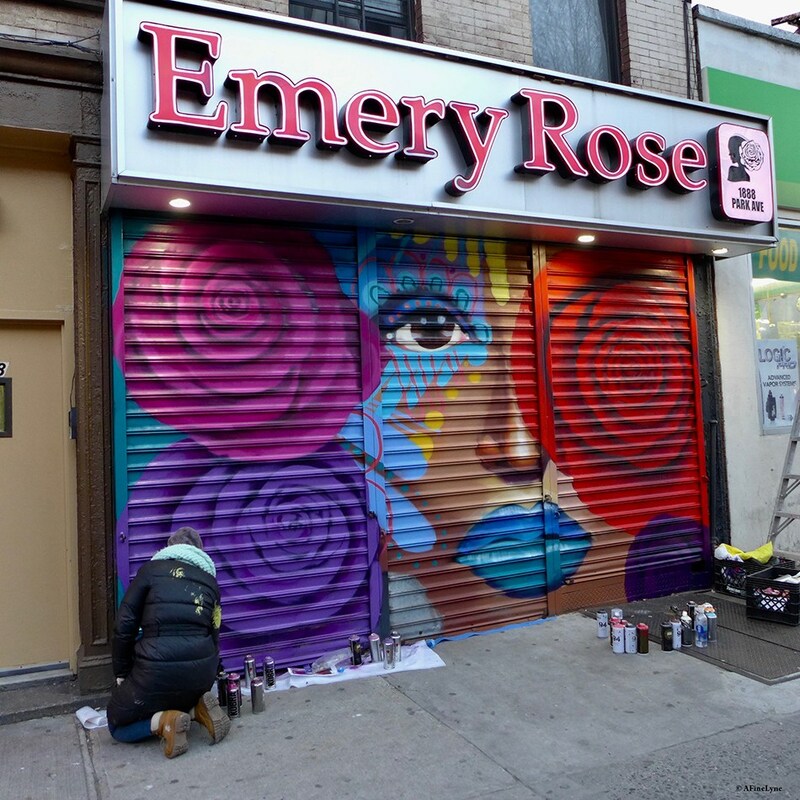 Artist Danielle Mastrion #danielebknyc working on Emery Rose Salon. 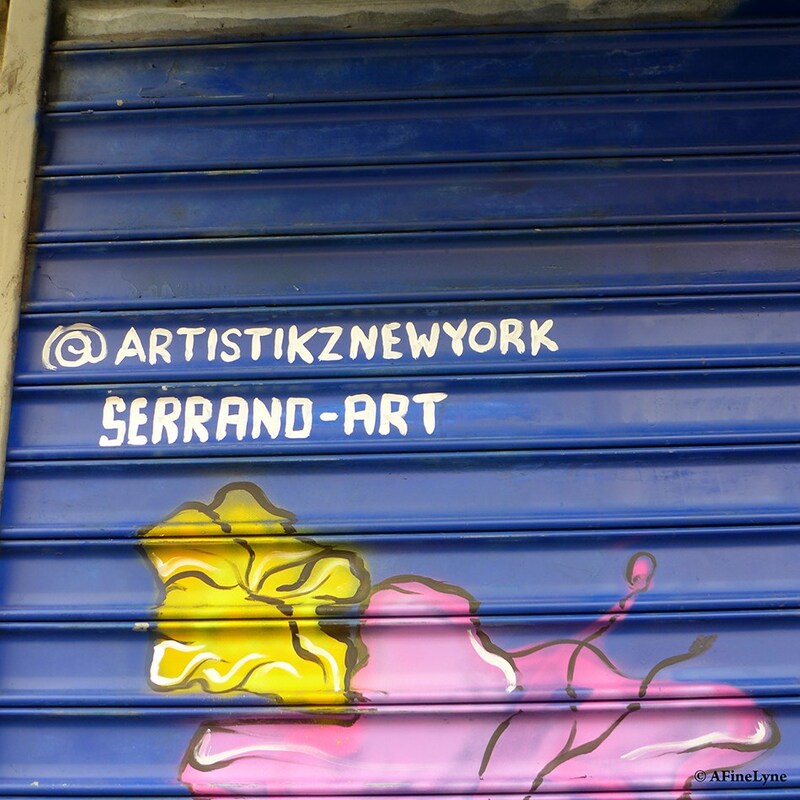 You can also follow the artist on Twitter, and on her website. 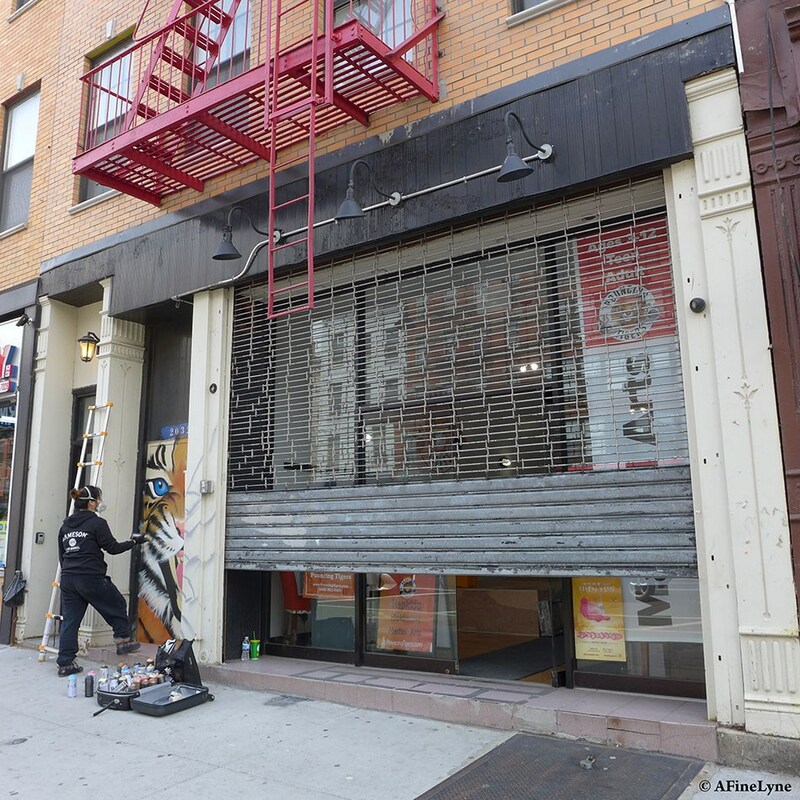 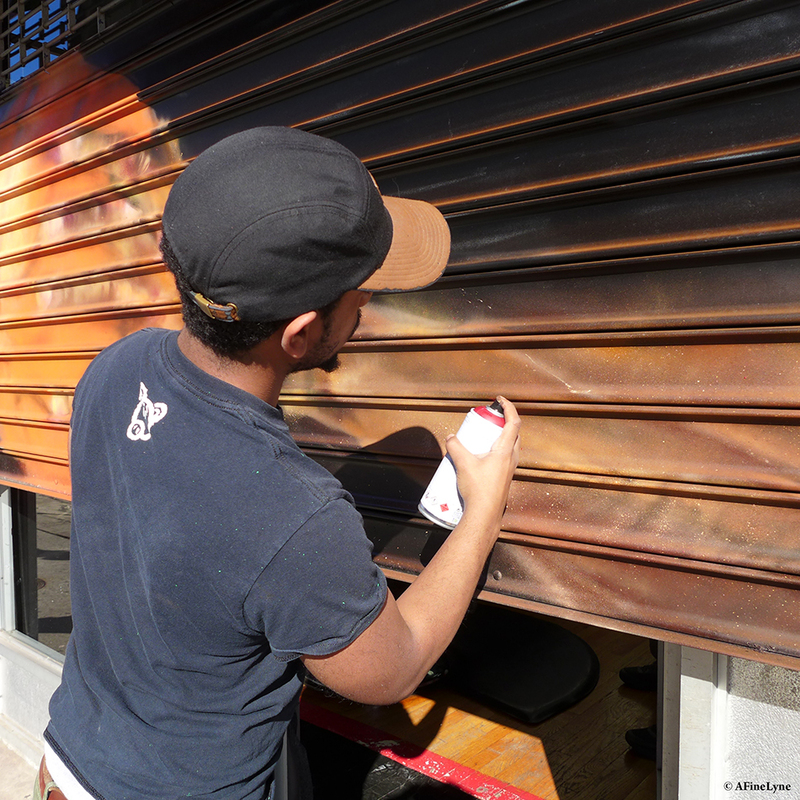 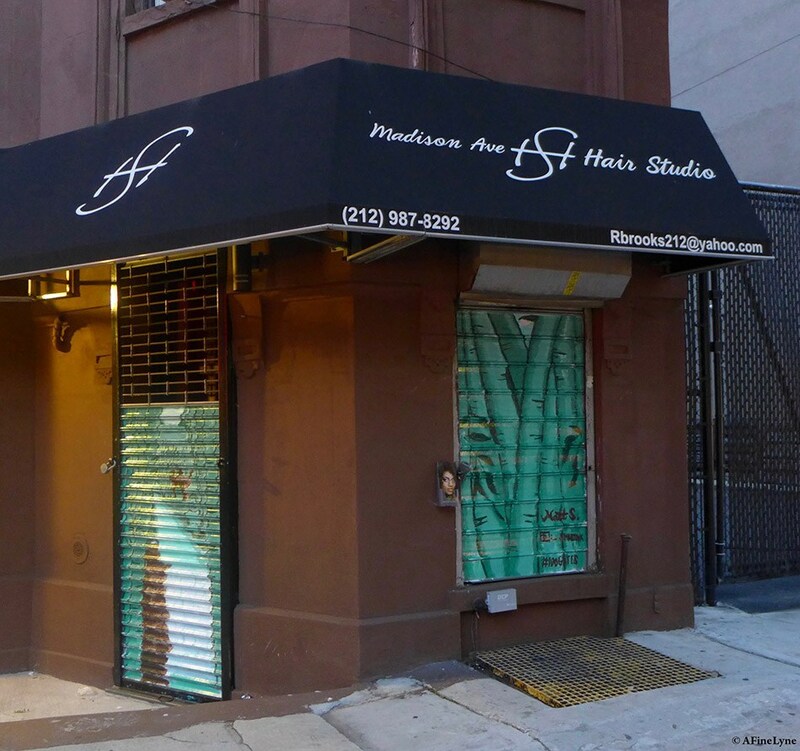 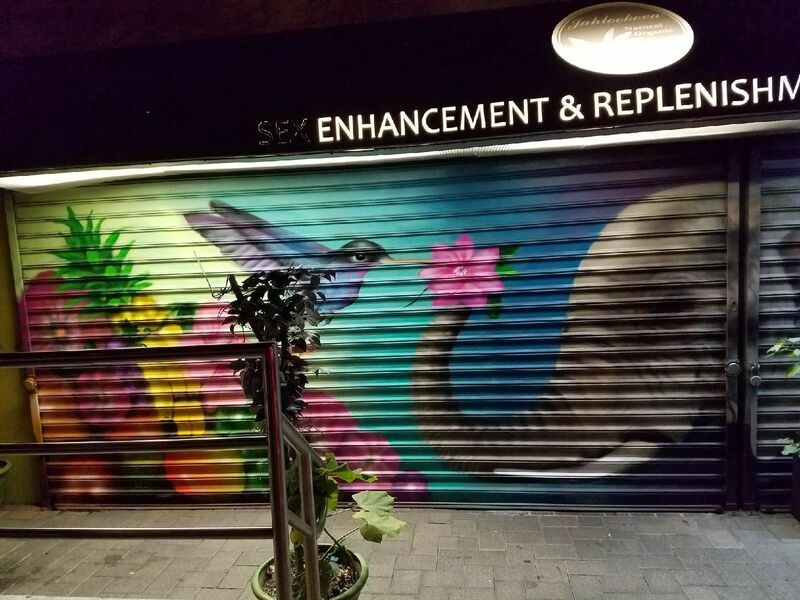 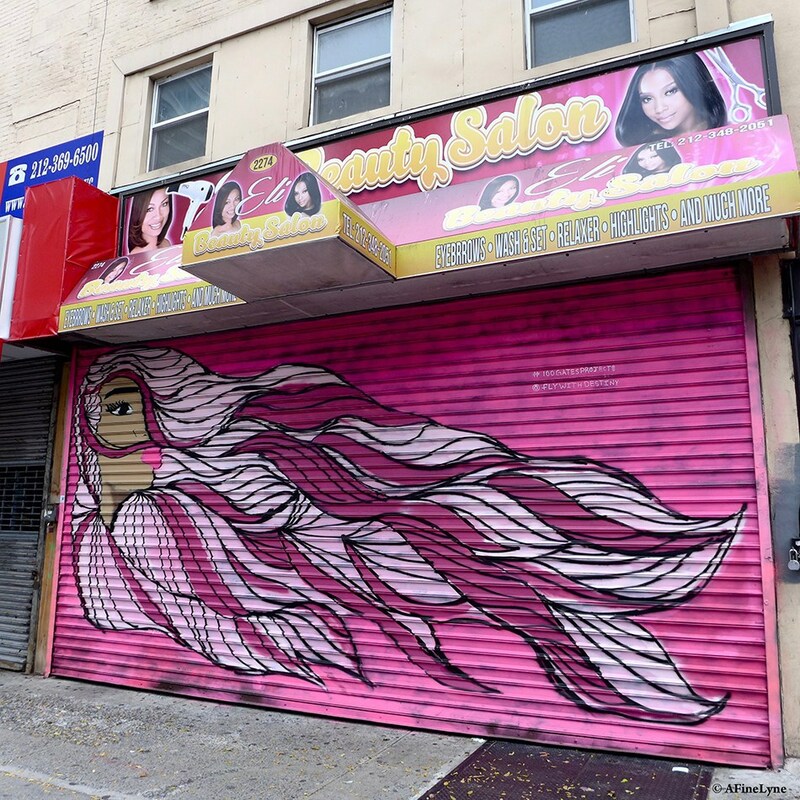 The Artist Matt Samuelson at Madison Avenue Hair Studio was the first gate painted for this project. 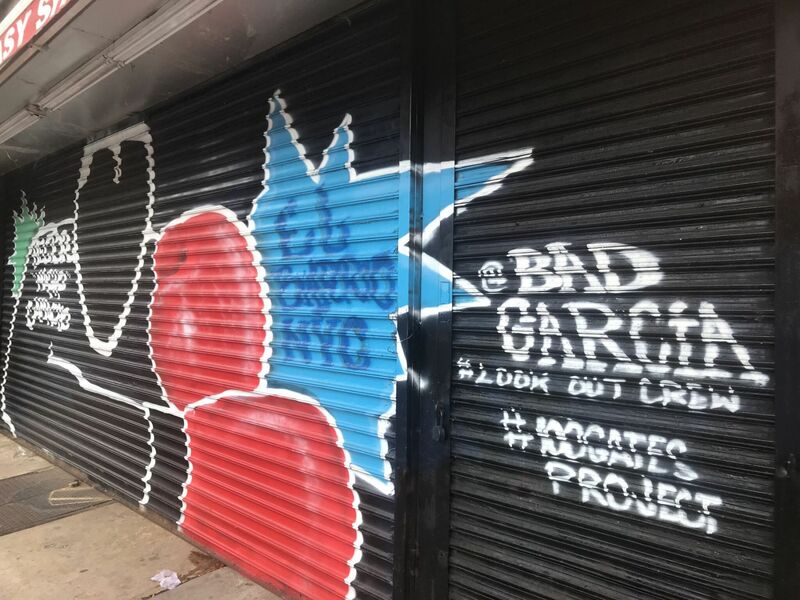 Take a look at the behind-the-scenes tour taken by NYC SBS, 100 Gates Project and NY1 interview with artist, Ralph Serrano. 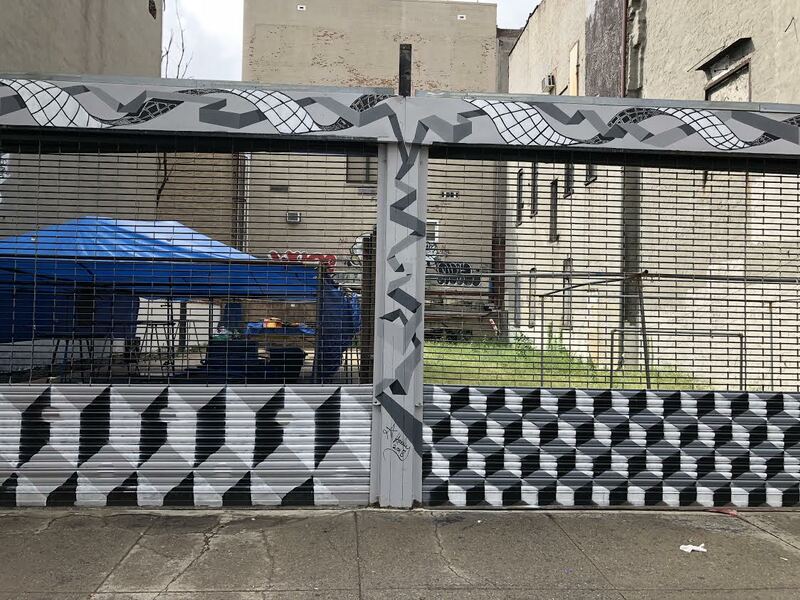 While you’re there, check out the new mural in White Park, and the continuously changing Guerrilla Wall, expressing local views and concerns on current issues. 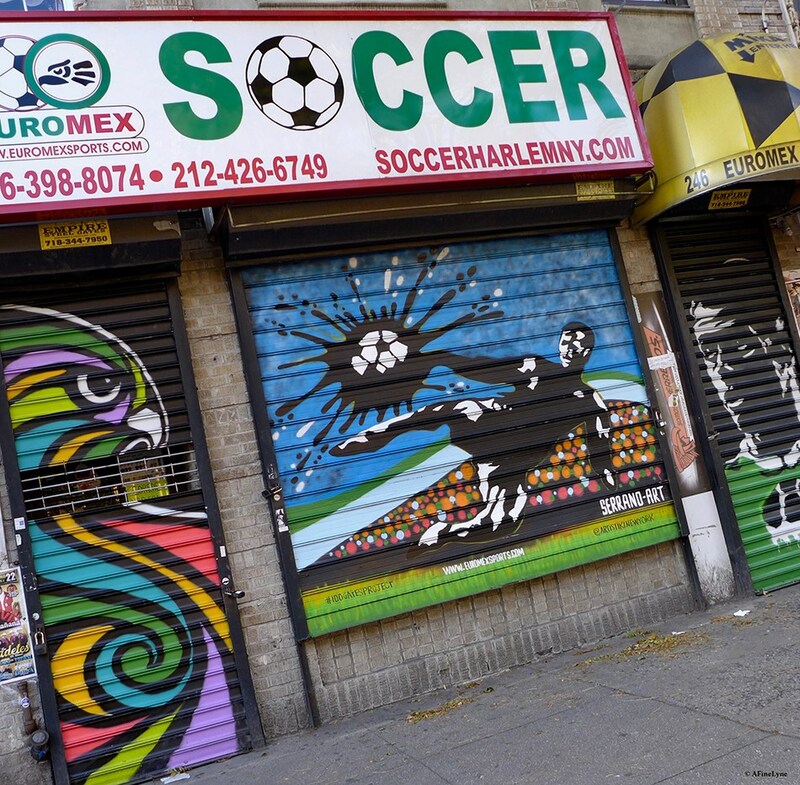 Current theme: Champions Battling Racism. 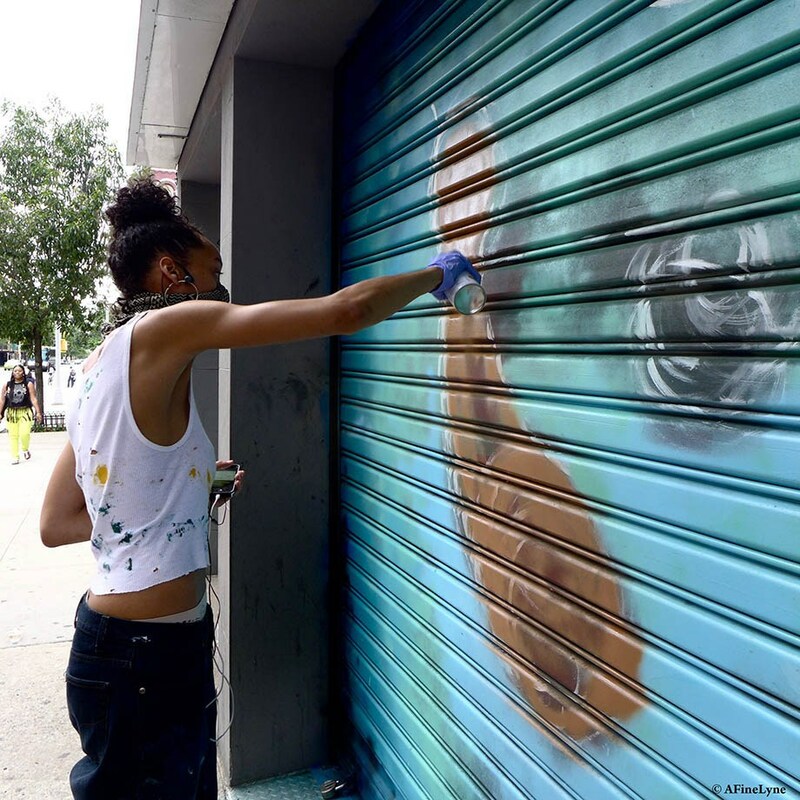 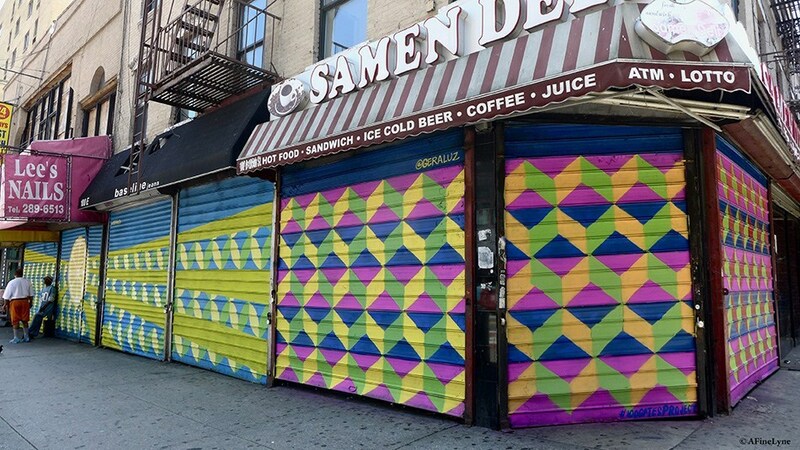 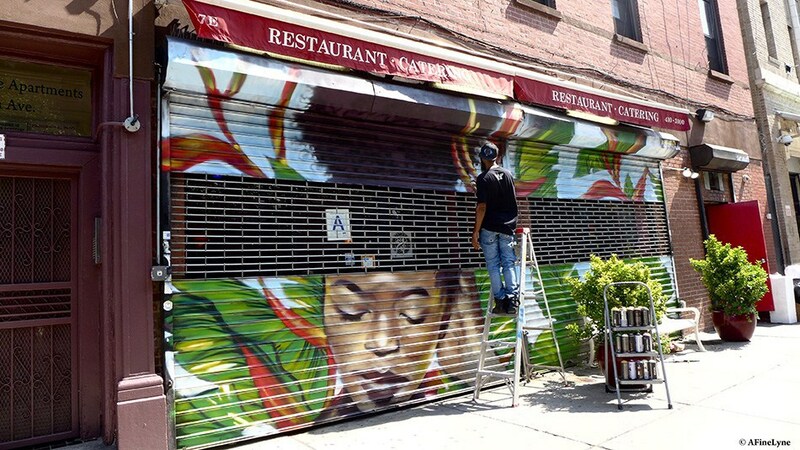 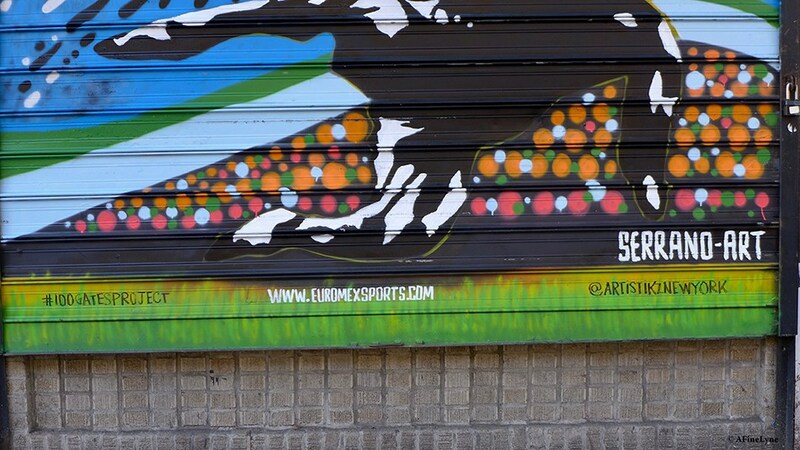 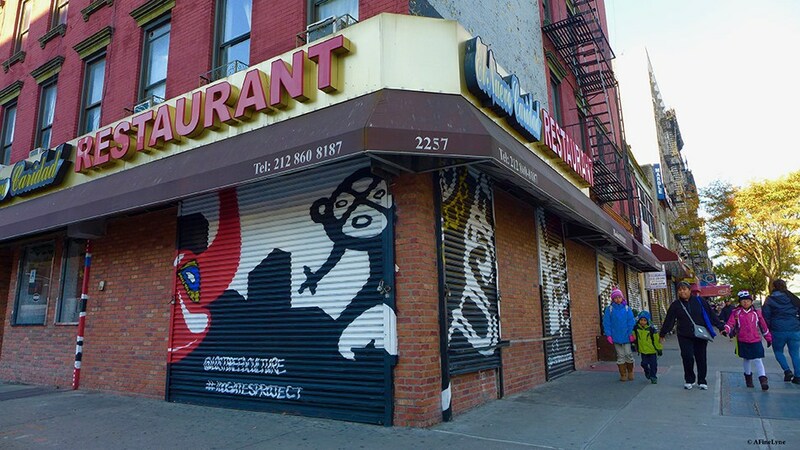 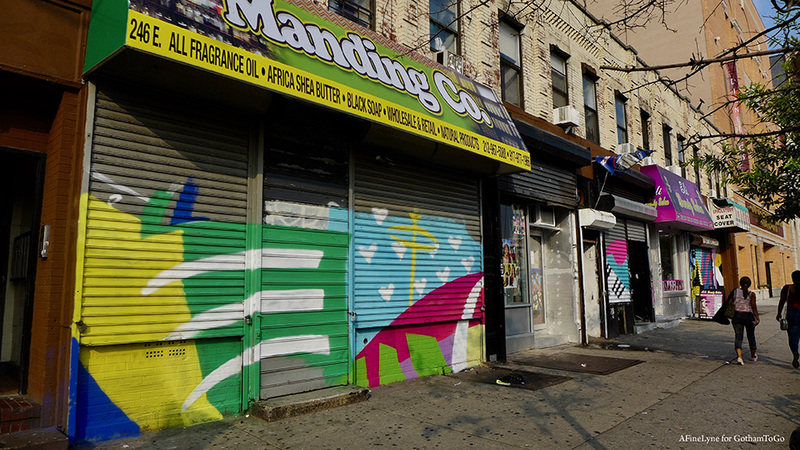 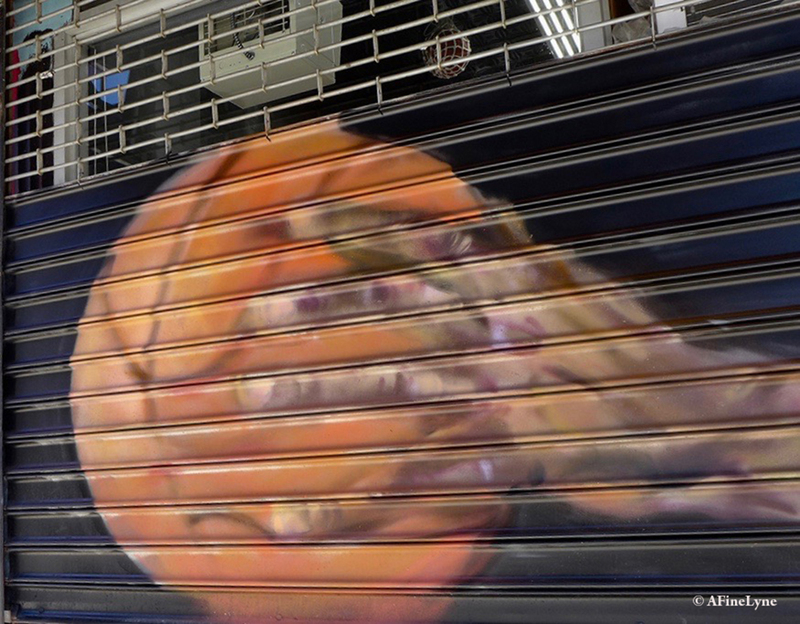 Many of the participating 100 Gates East Harlem Project artists are part of the Harlem Art Collective/Guerrilla Wall. 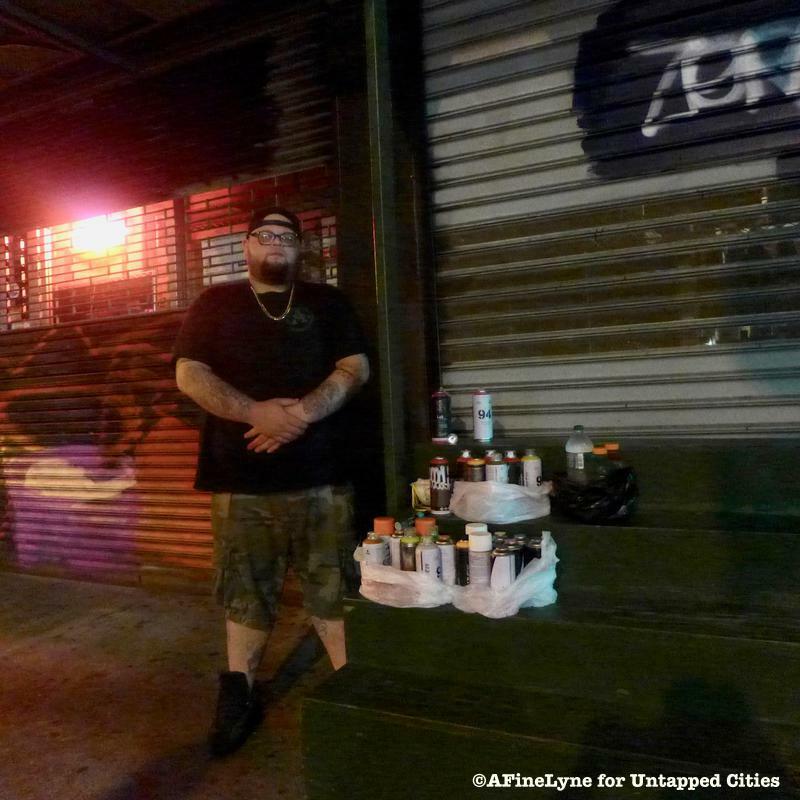 For more going on in the area. 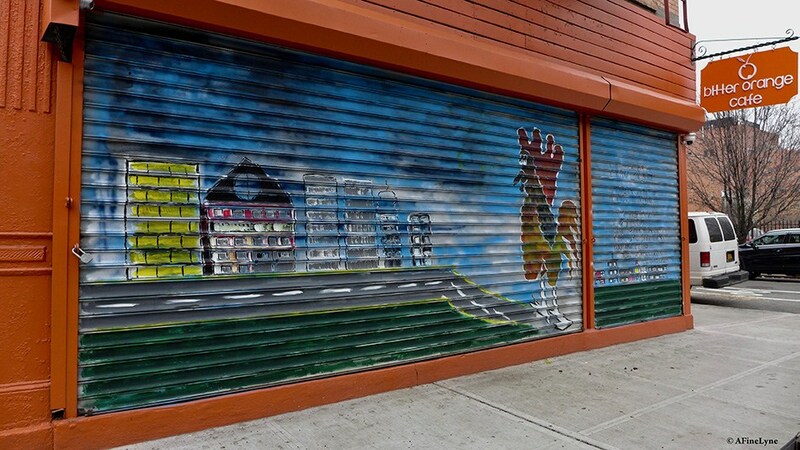 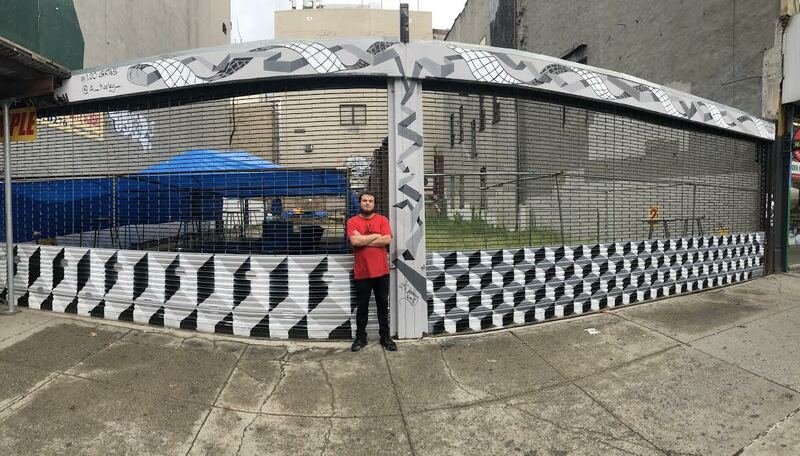 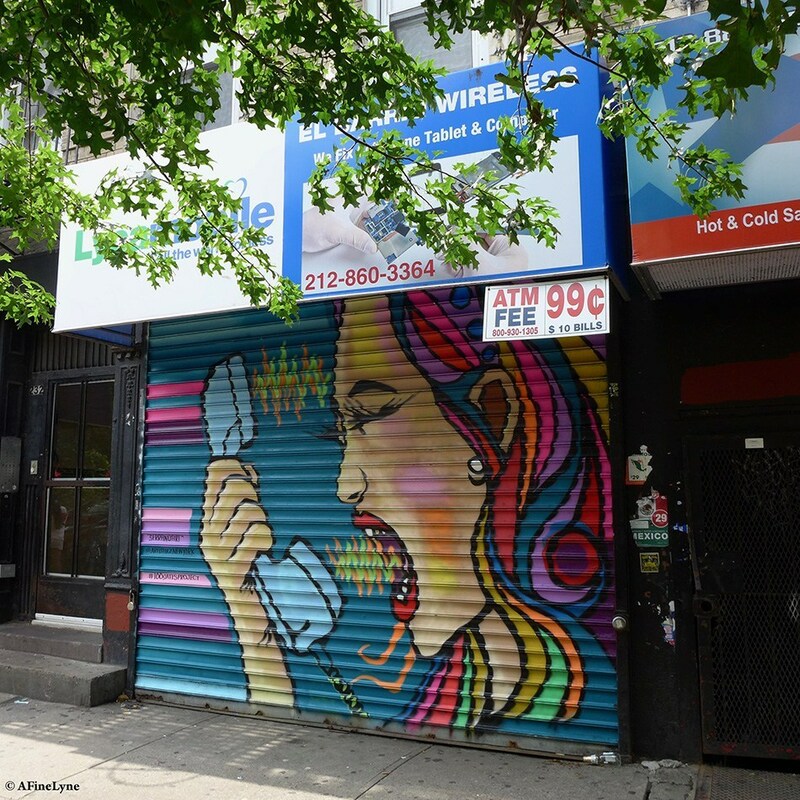 Check out the #100GatesProject in Staten Island.